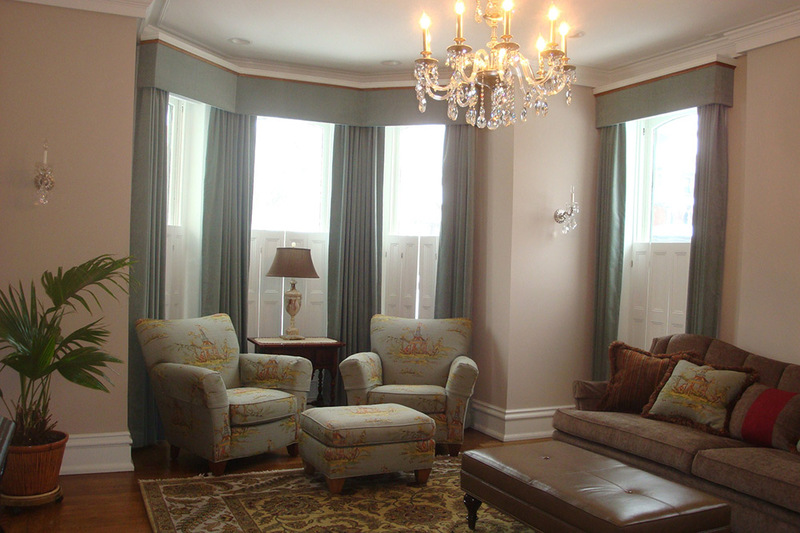 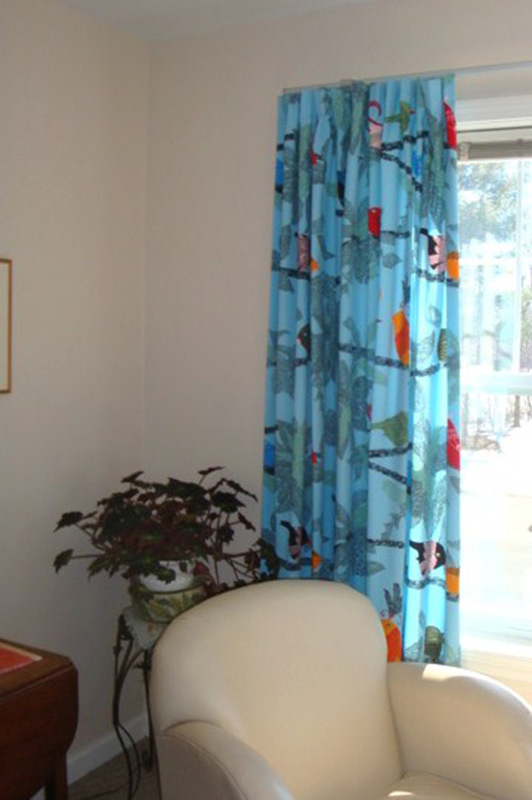 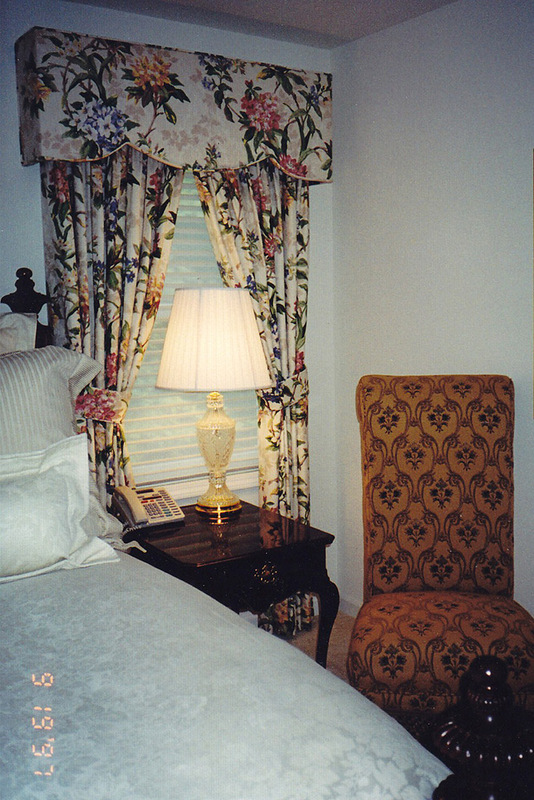 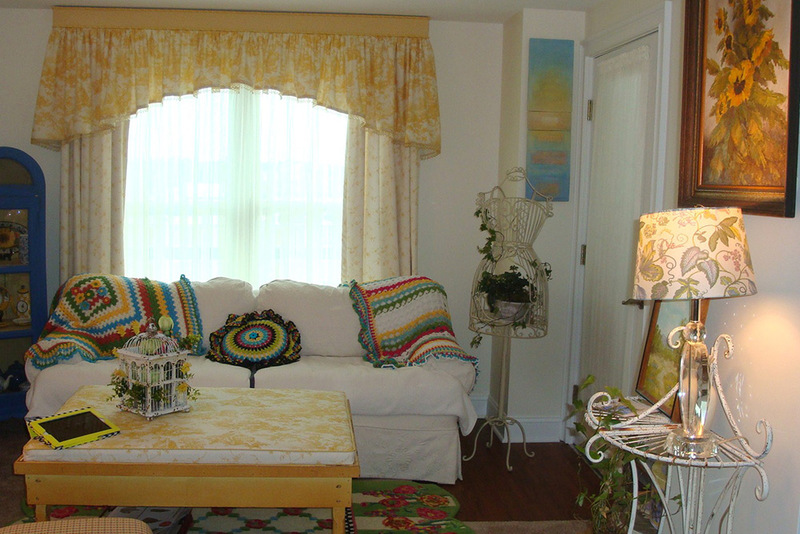 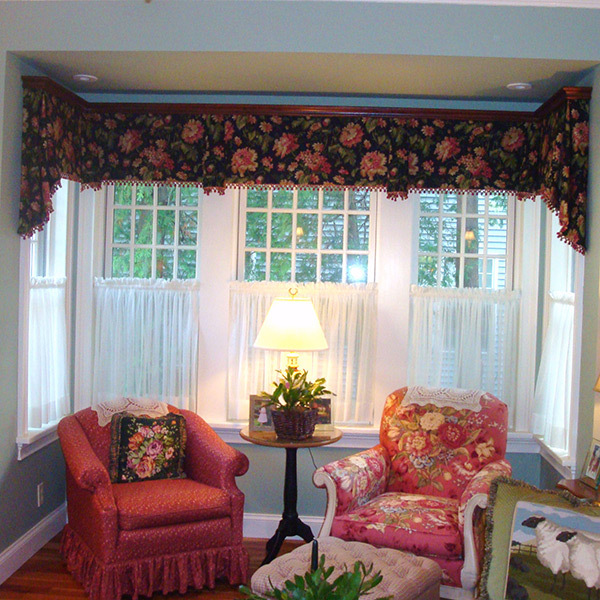 Best Dressed Windows in Town specializes in creating beautiful custom-made fabric window treatments. 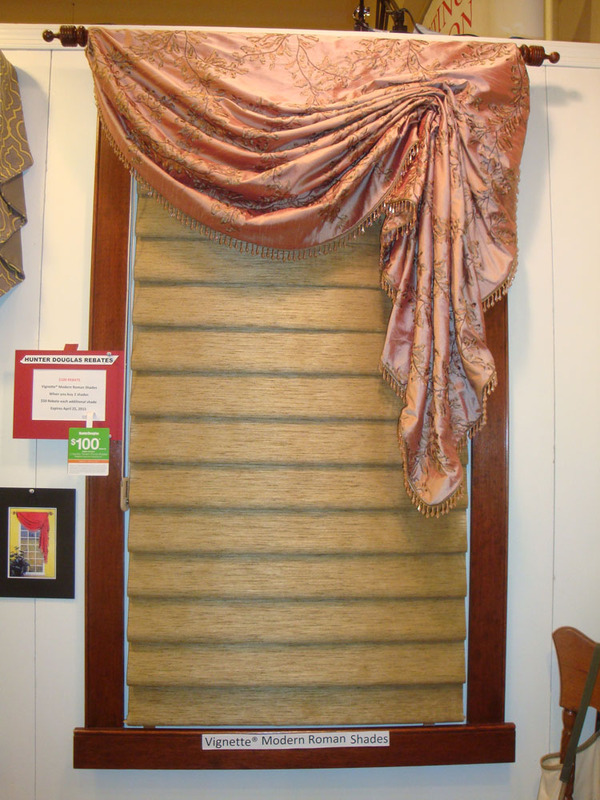 There are so many styles, fabrics, trims, and hardware options that the possibilities are endless. 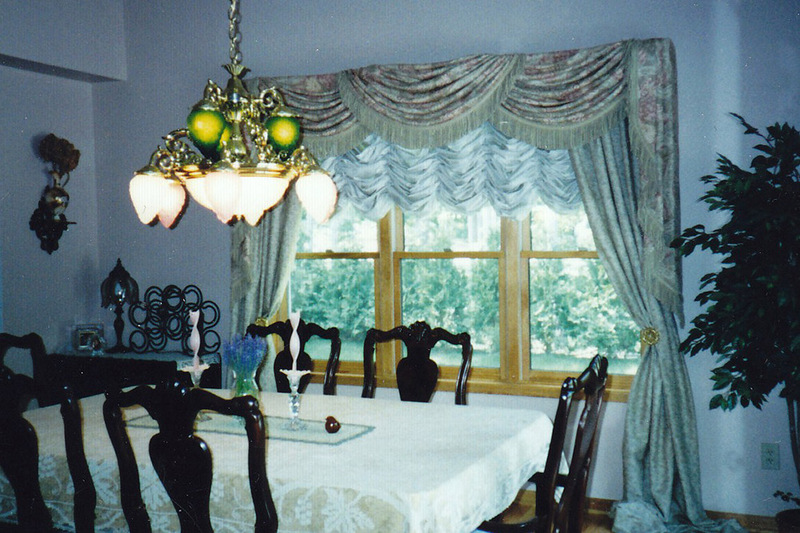 From the moment you contact us, you’ll see why shopping local just makes sense when it comes to buying custom-made window treatments. 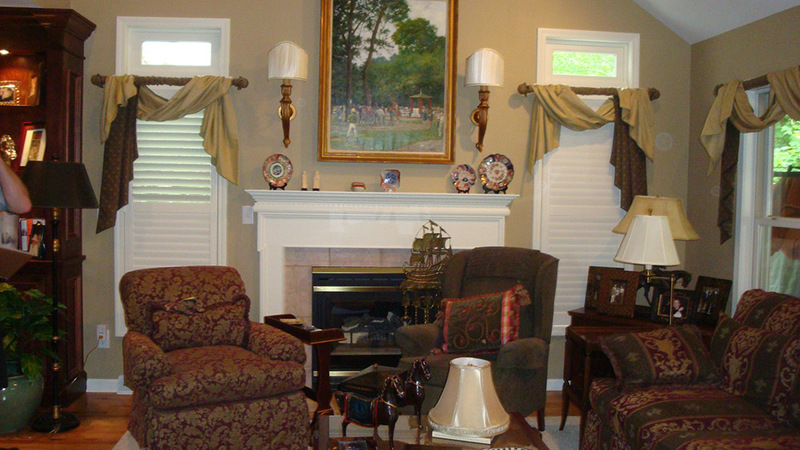 You’ll receive personal, friendly service and your sales tax dollars will help to build a stronger regional economy. 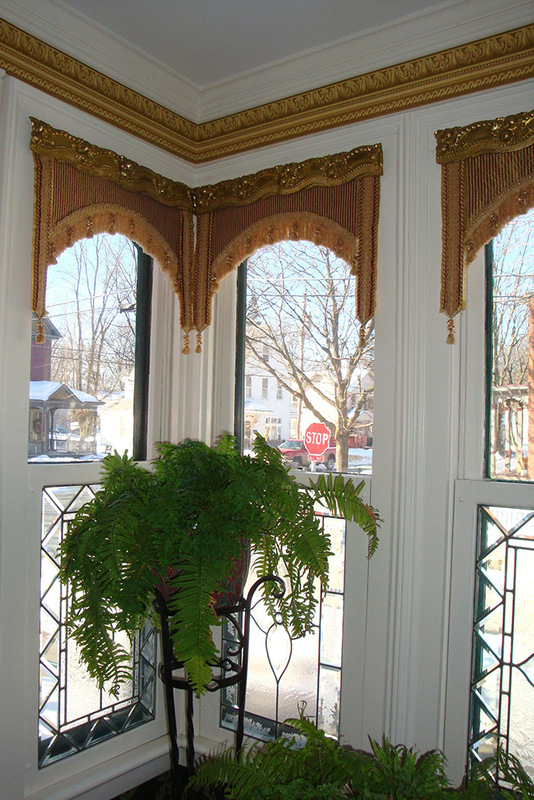 Buy with Best Dressed Windows in Town to get quality products and attentive service while building a stronger local economy. 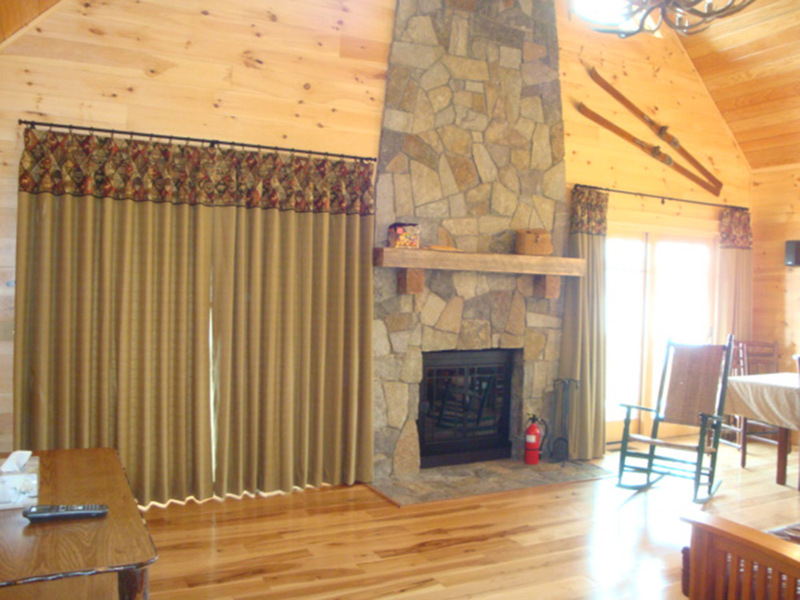 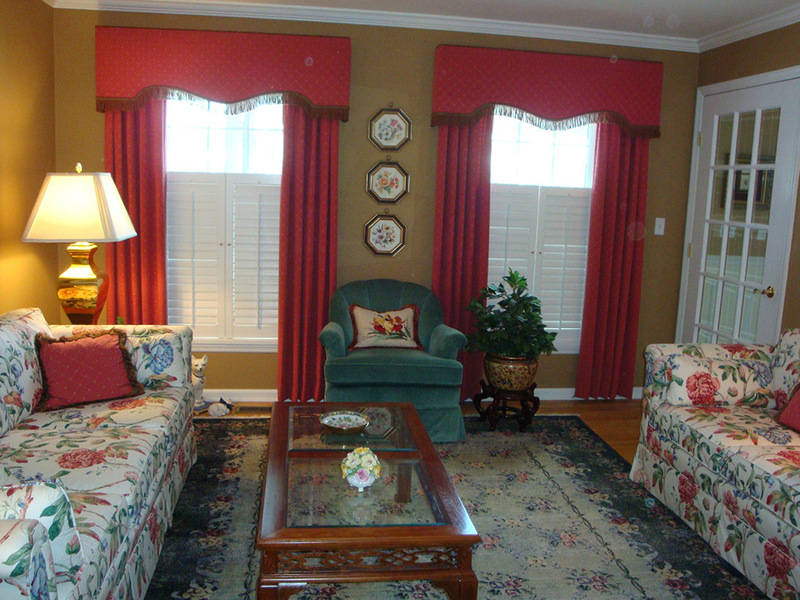 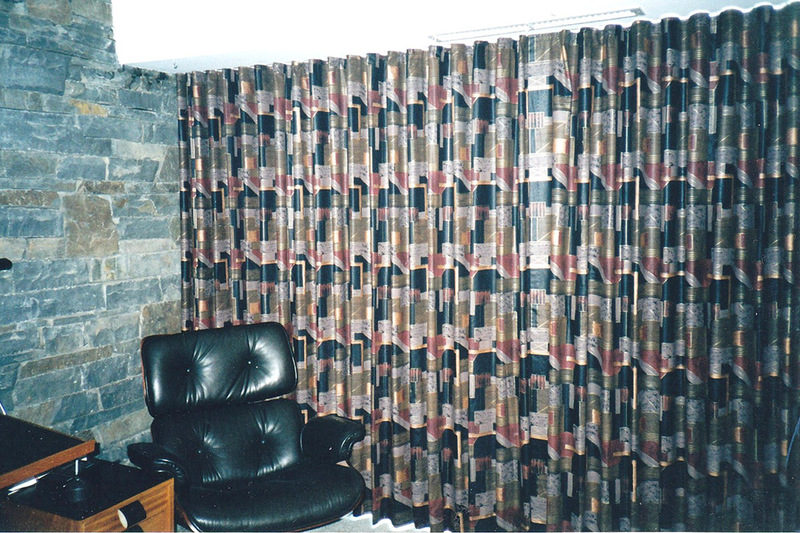 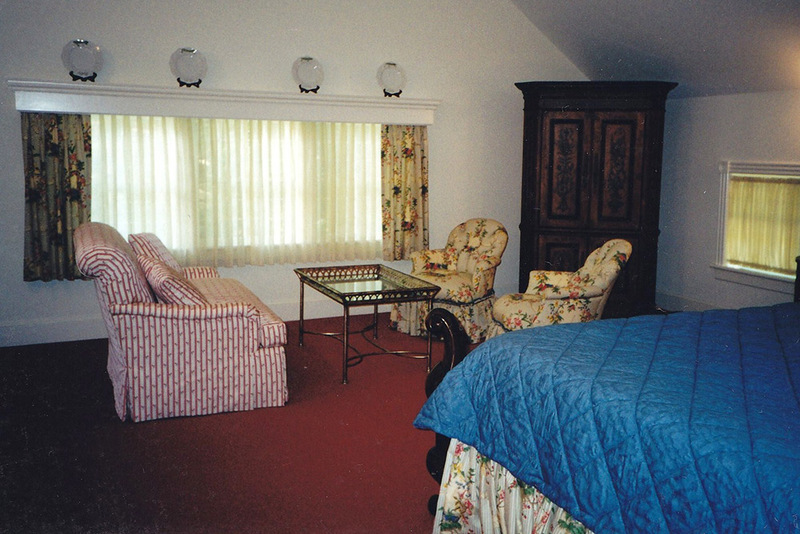 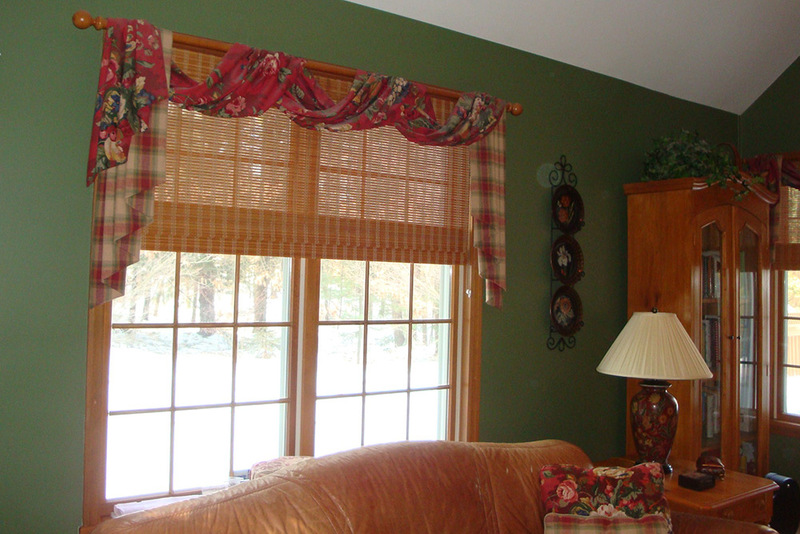 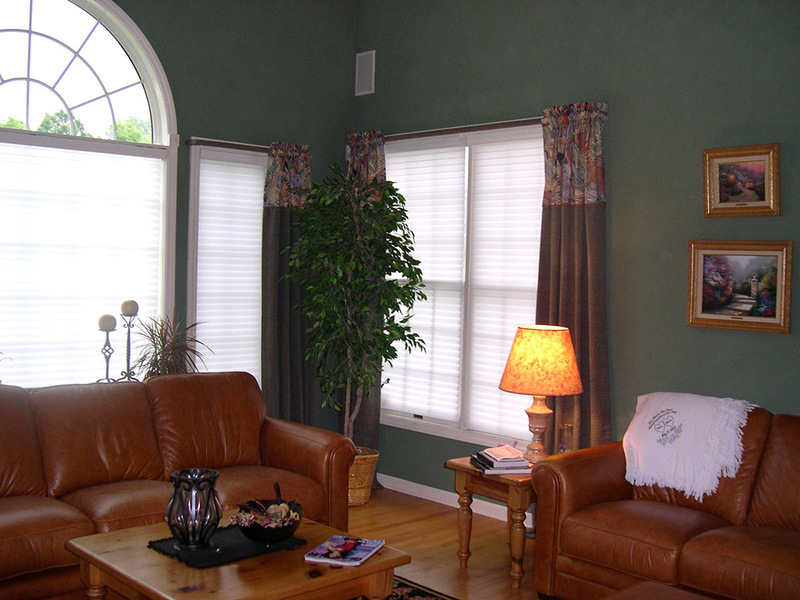 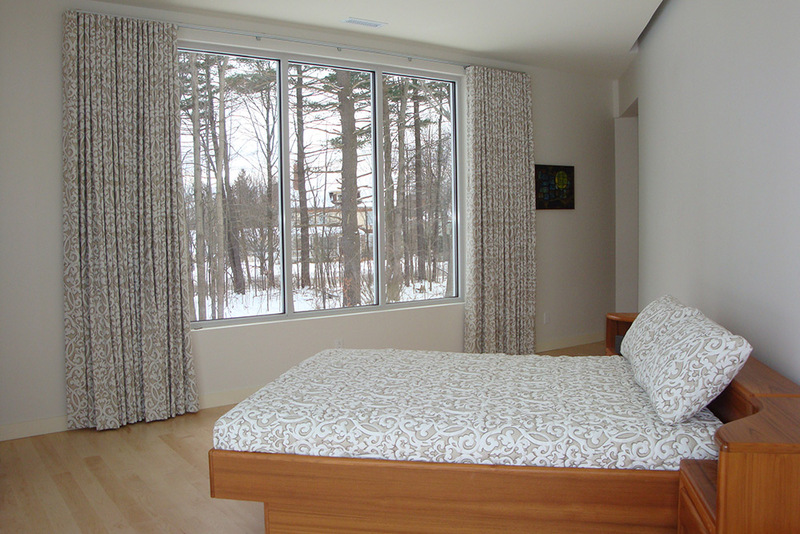 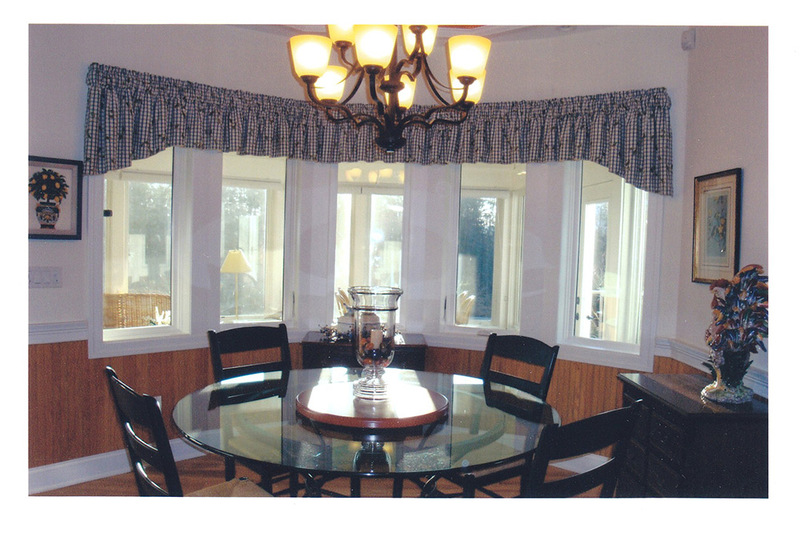 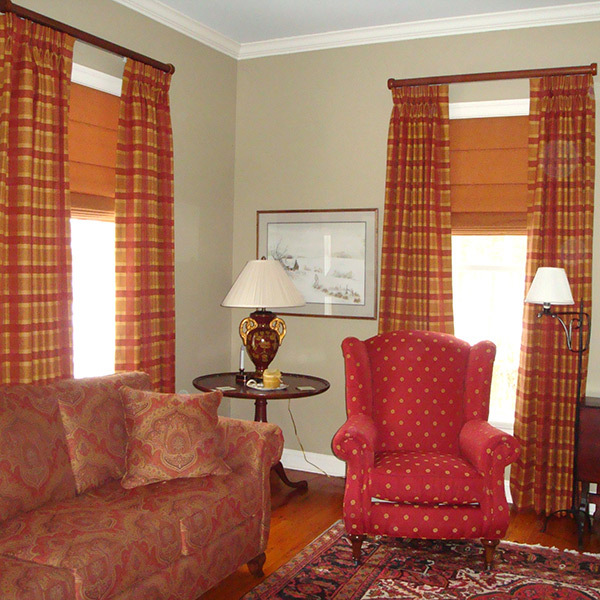 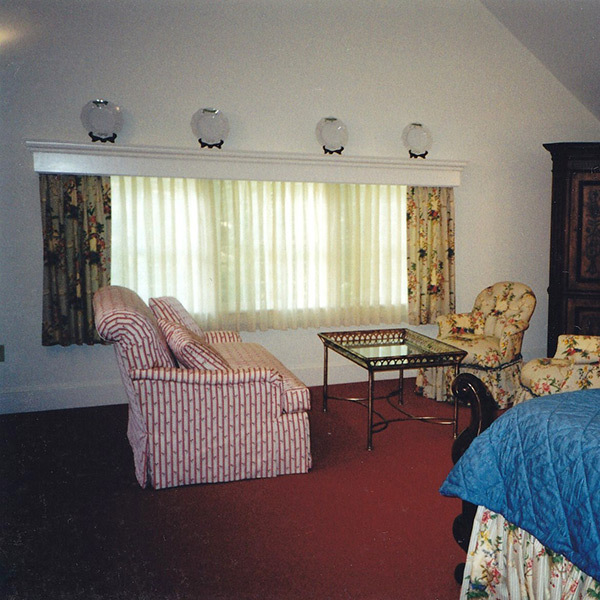 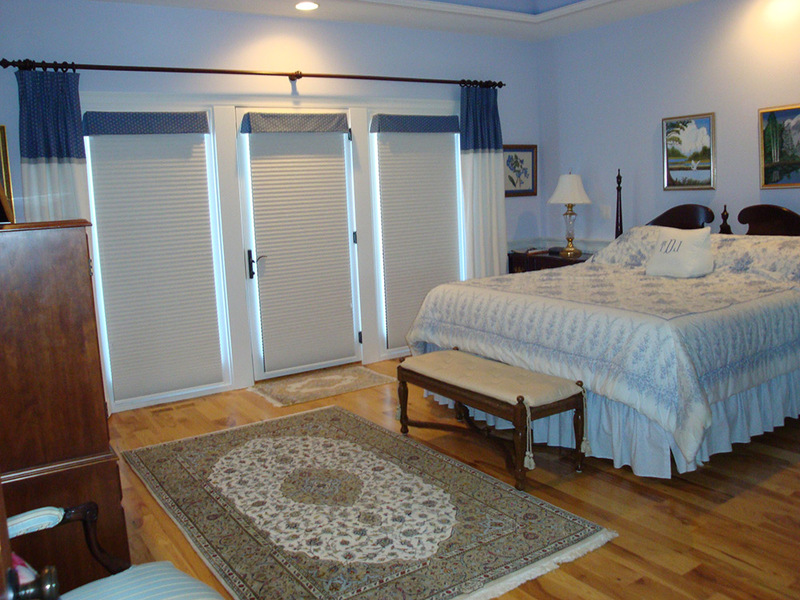 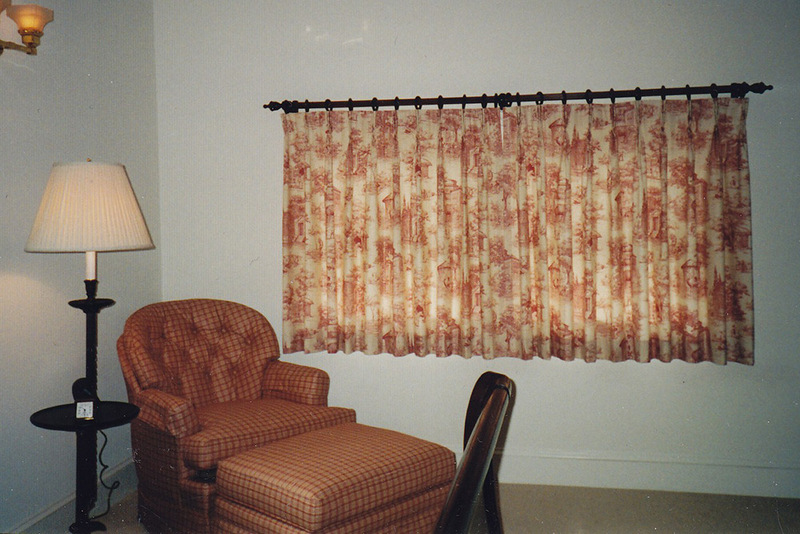 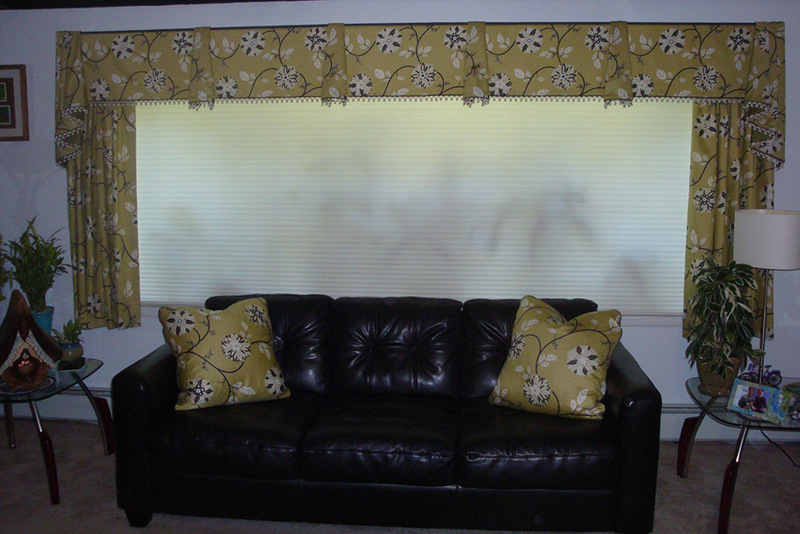 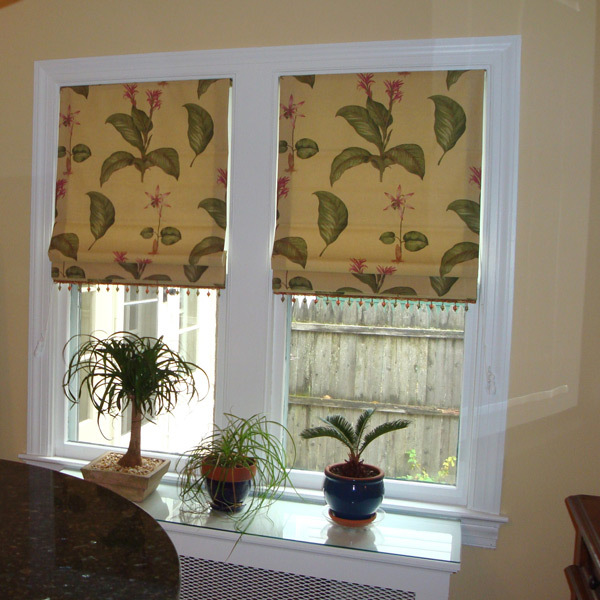 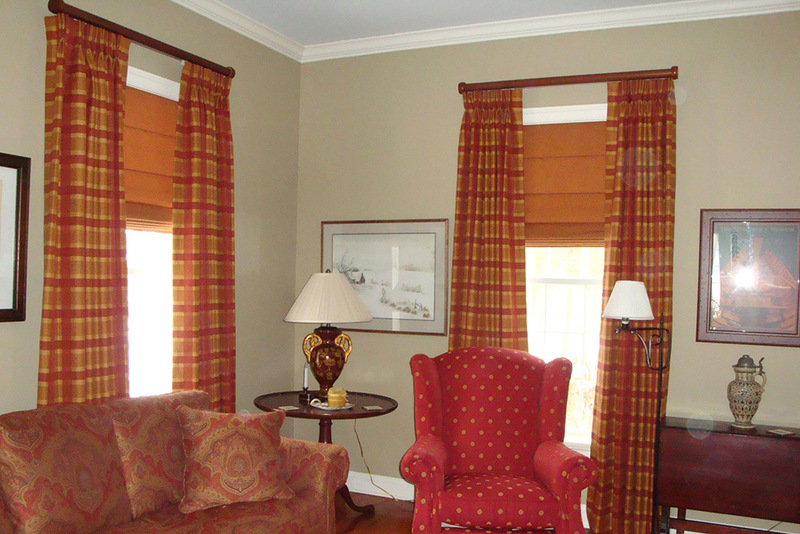 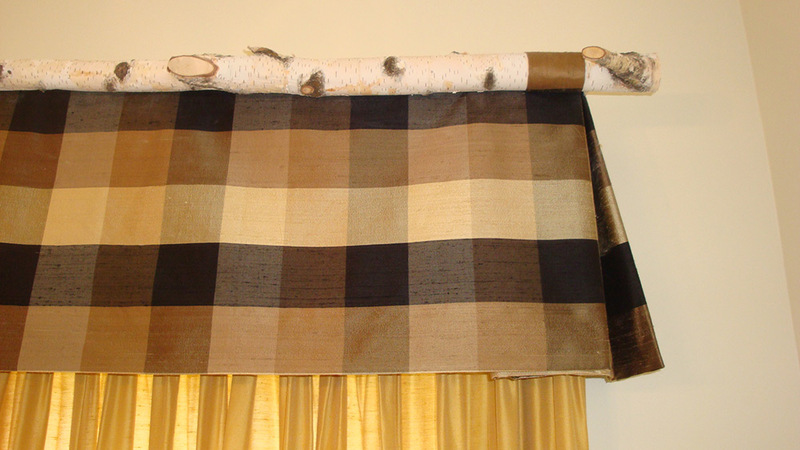 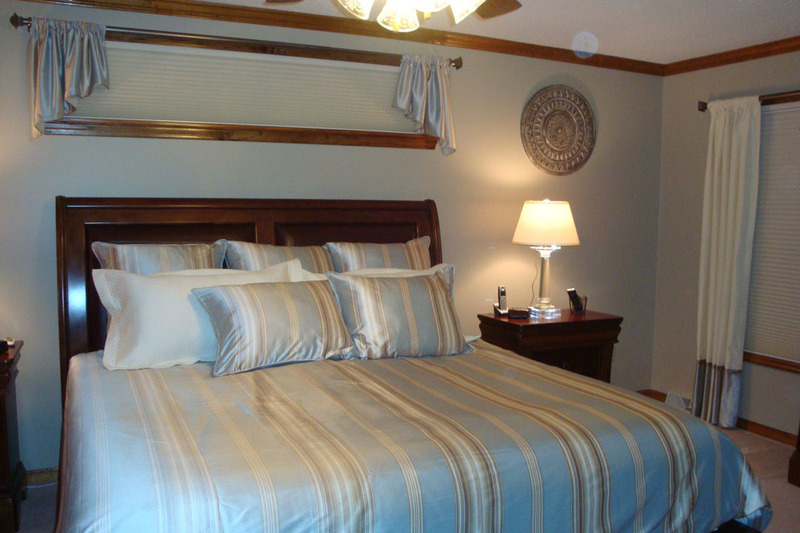 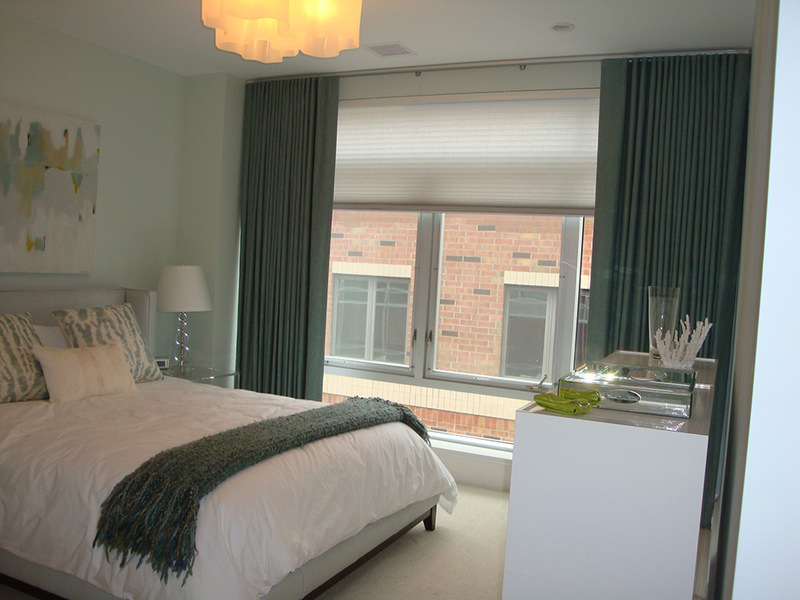 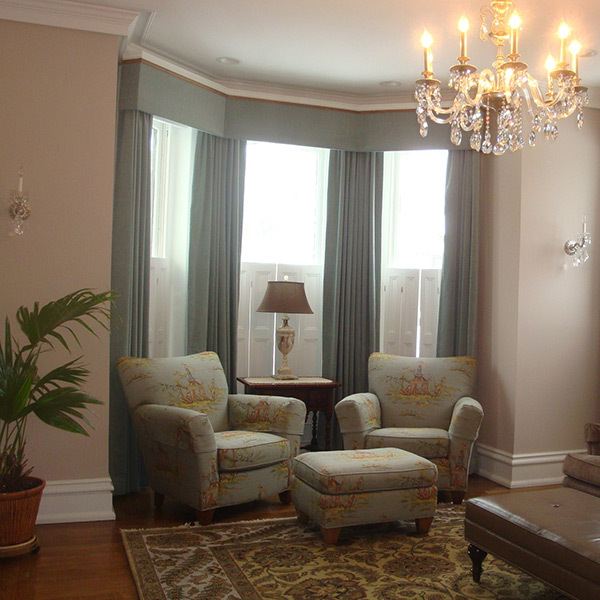 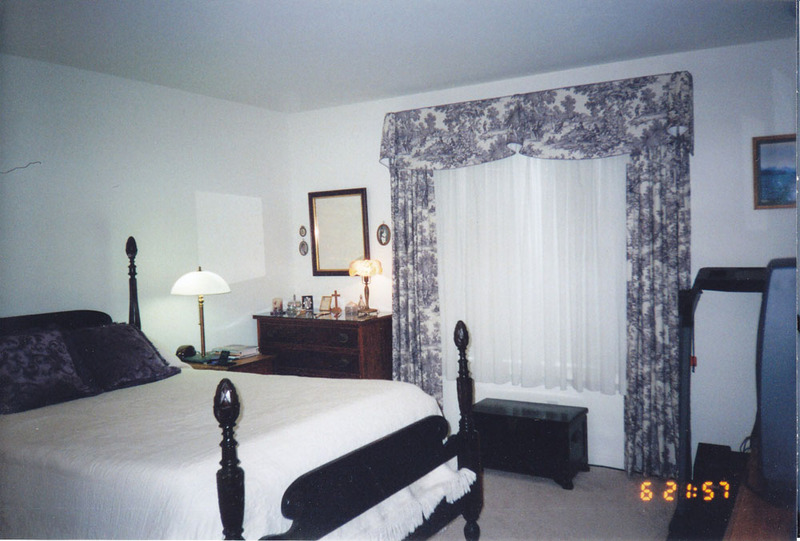 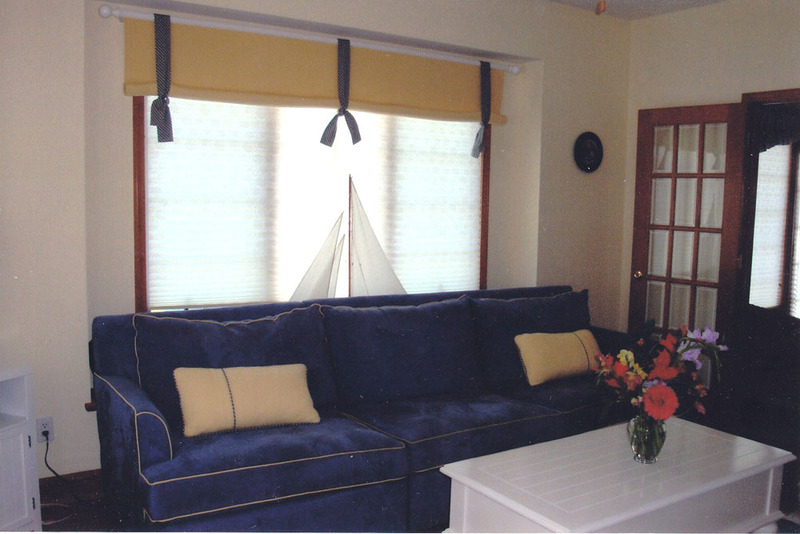 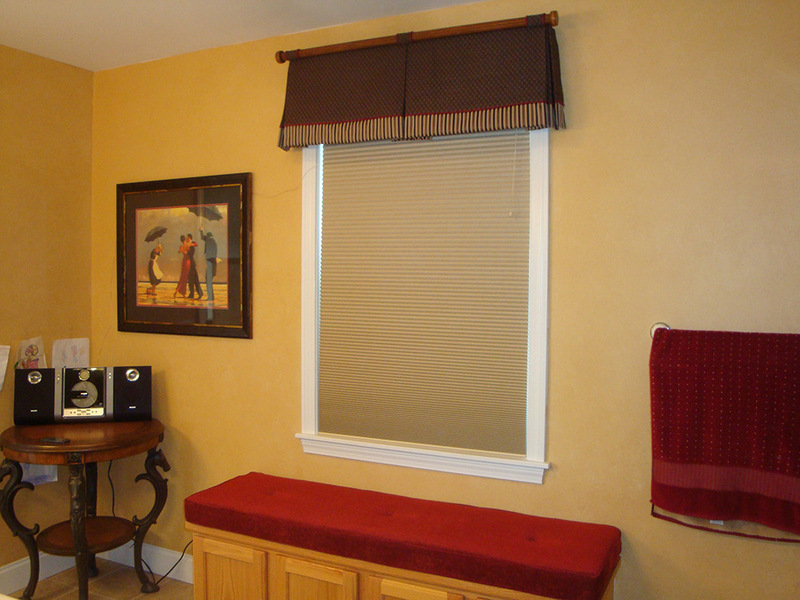 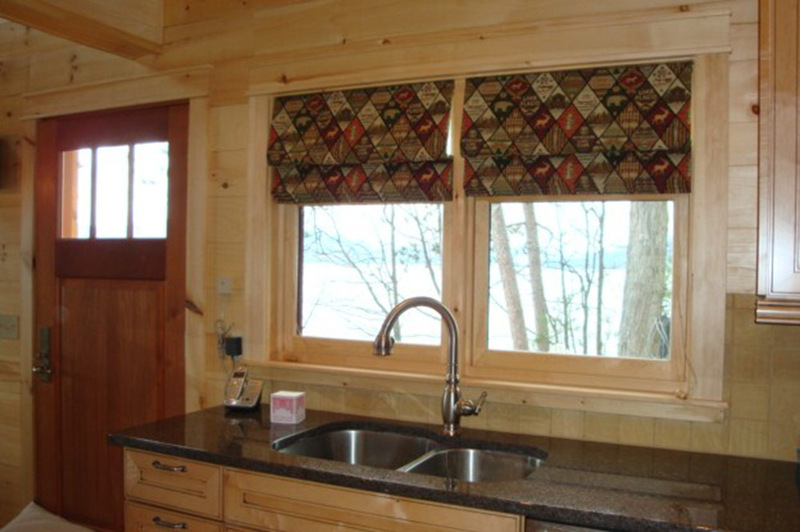 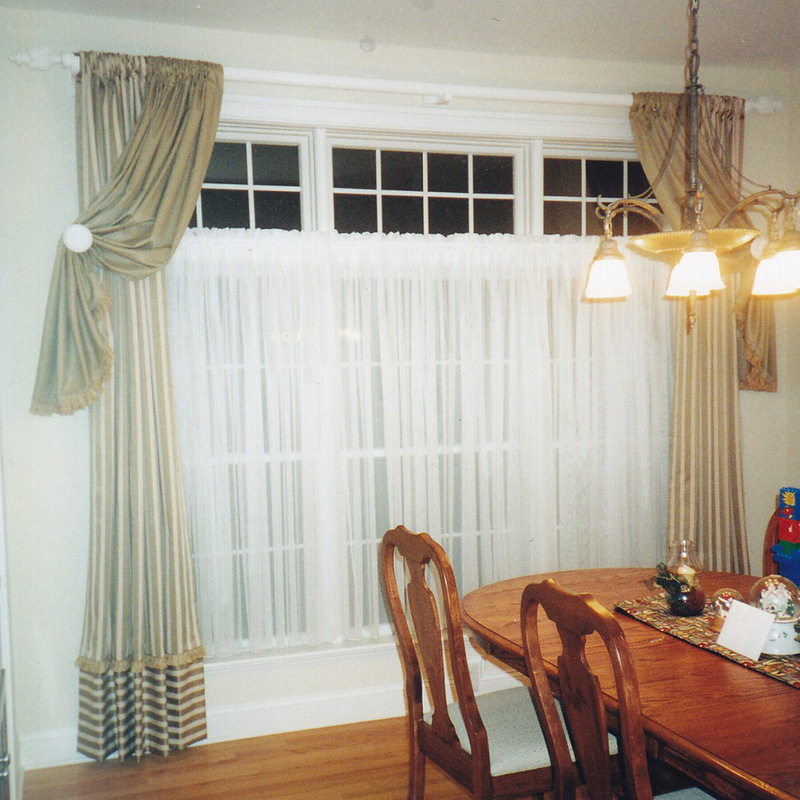 All of the following window treatments are custom-made from the carefully selected fabric. 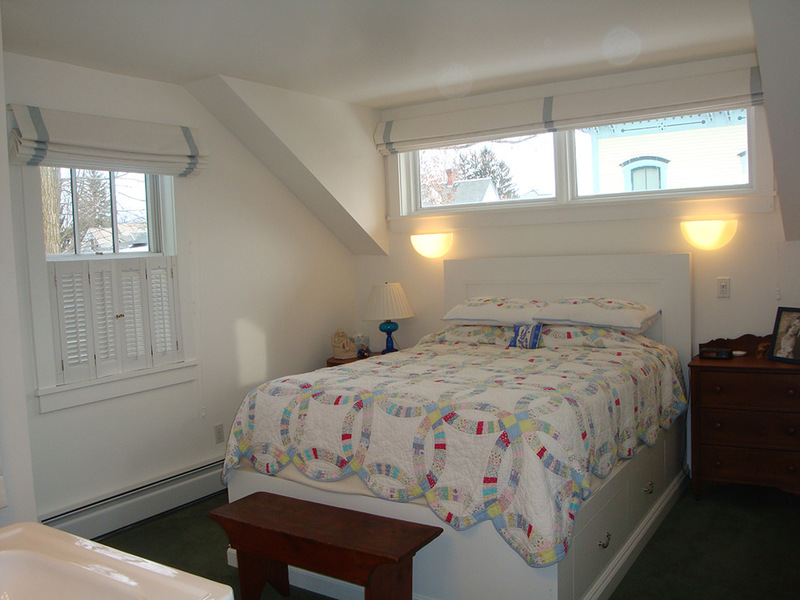 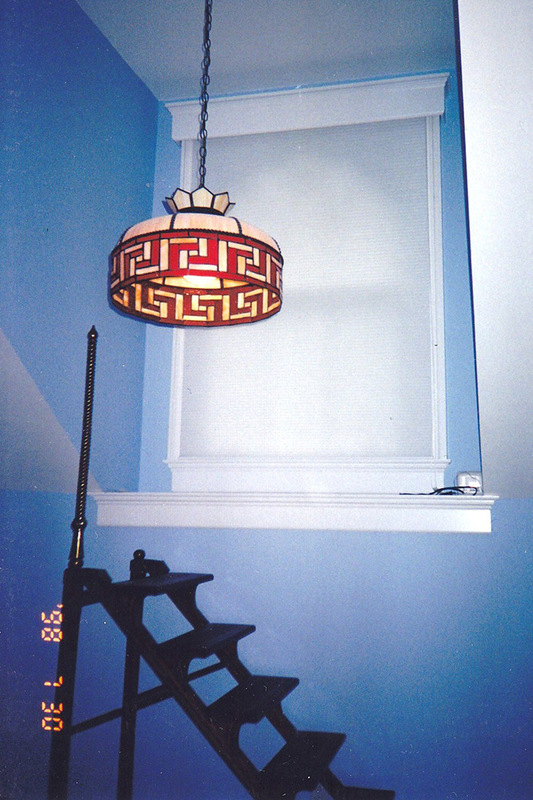 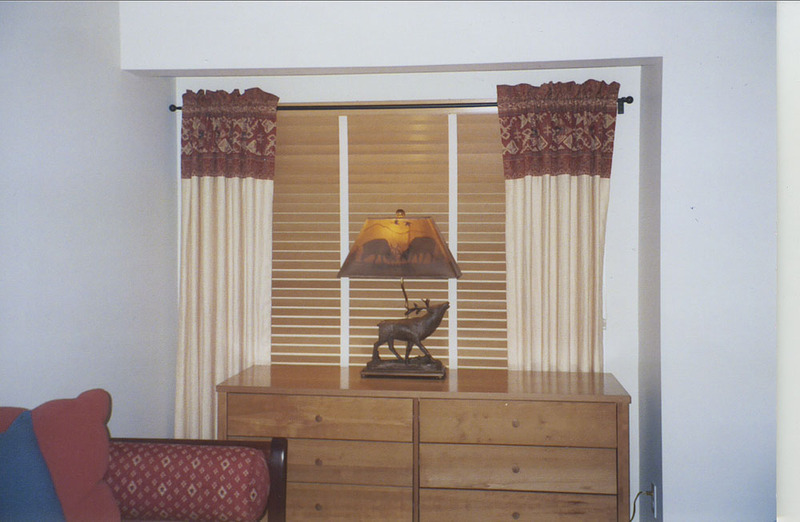 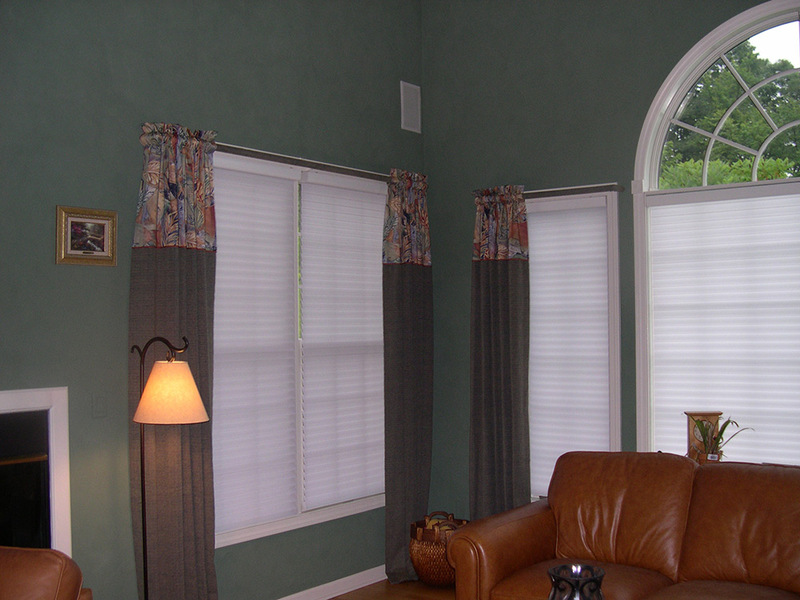 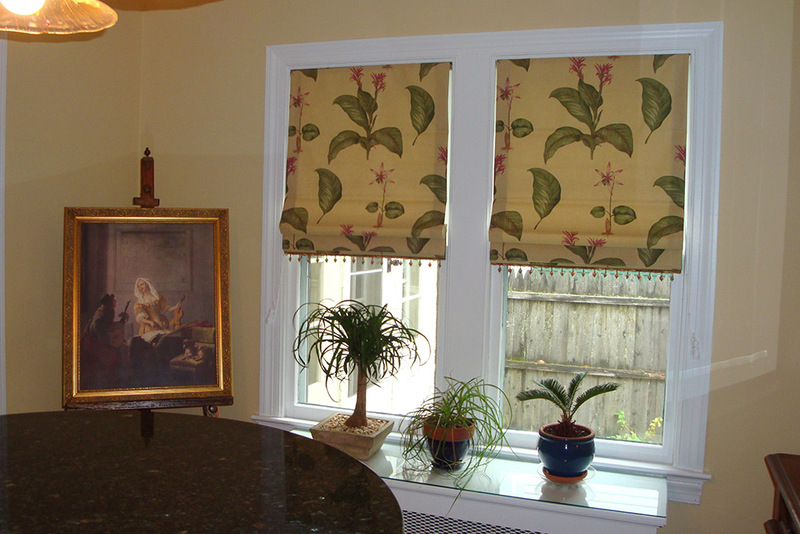 Roman Shades can be flat, hobbled, or have battens added to create shadow lines. 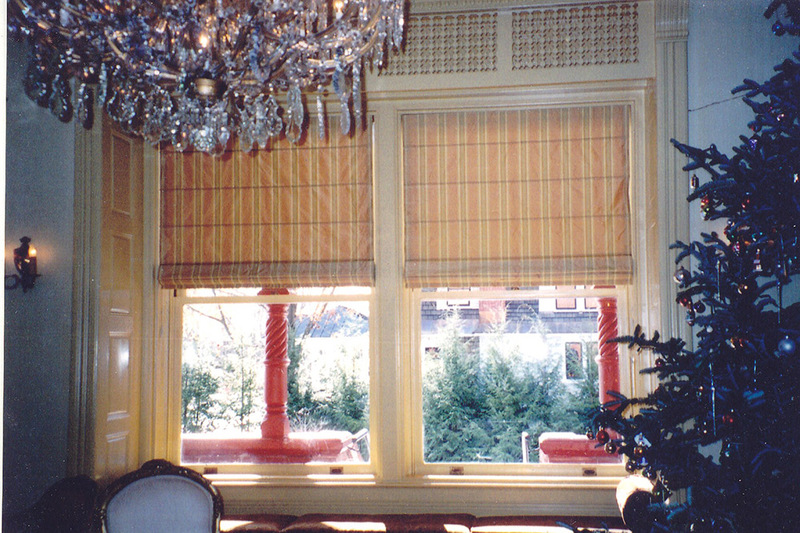 Balloon Shades can be gathered or tailored. 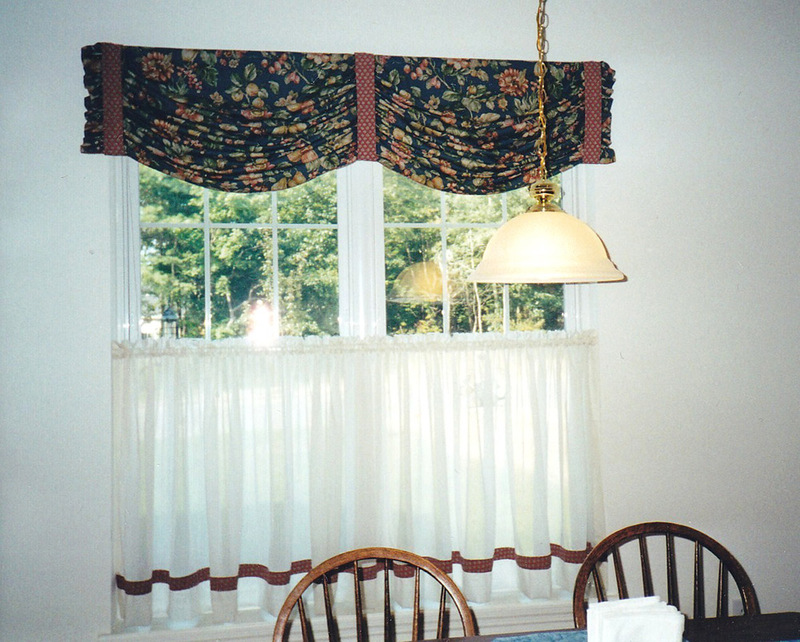 When lowered, they function as a shade; when raised, they look like a valance. 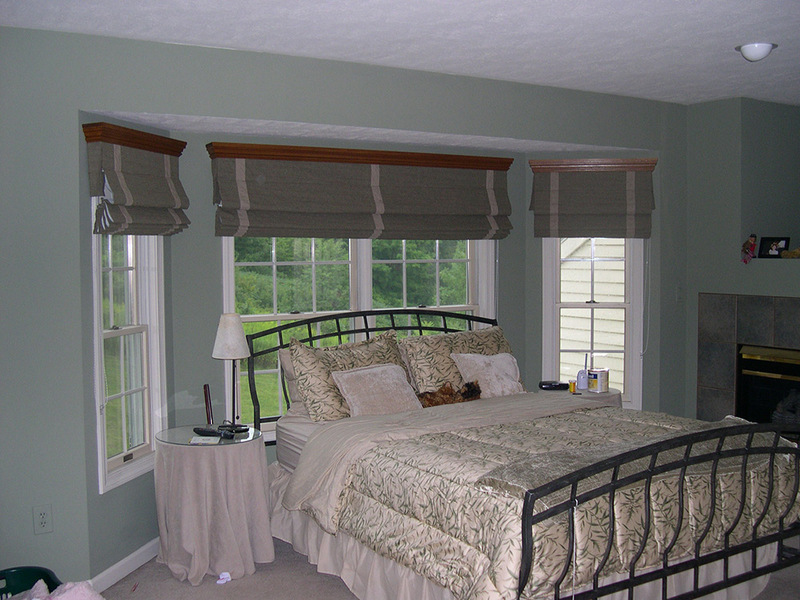 Austrian Shades are constructed of sheer or semi-sheer fabric and are unlined. 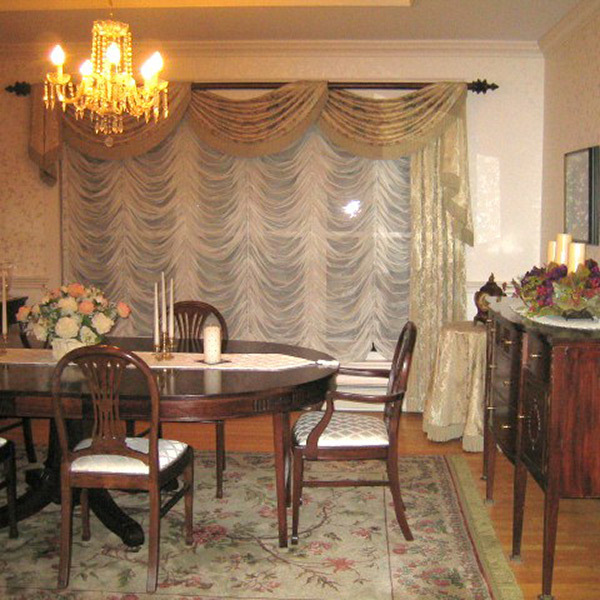 This is a very traditional, “Old World” design. 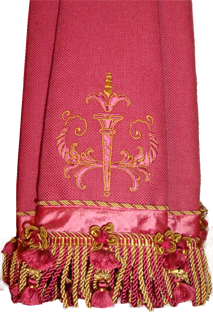 Swags and Cascades come in many shapes and sizes. 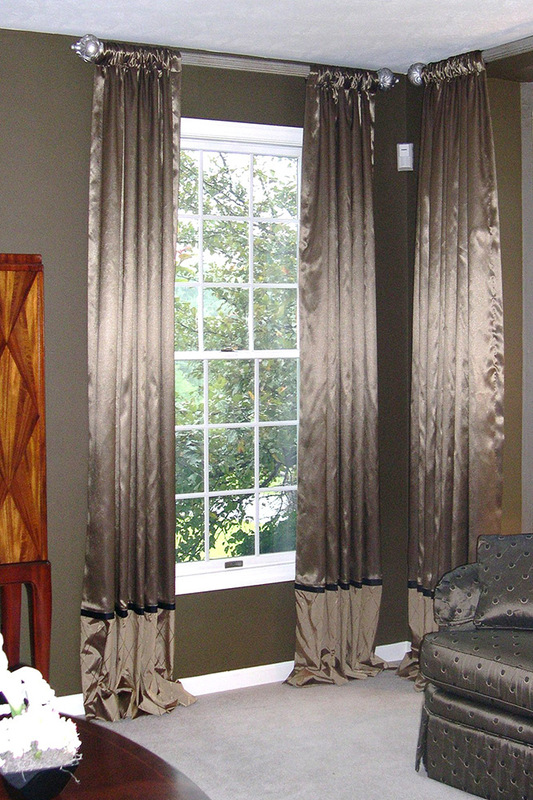 They are as classic and essential to window treatments as the “Little Black Dress” is in a woman’s wardrobe. 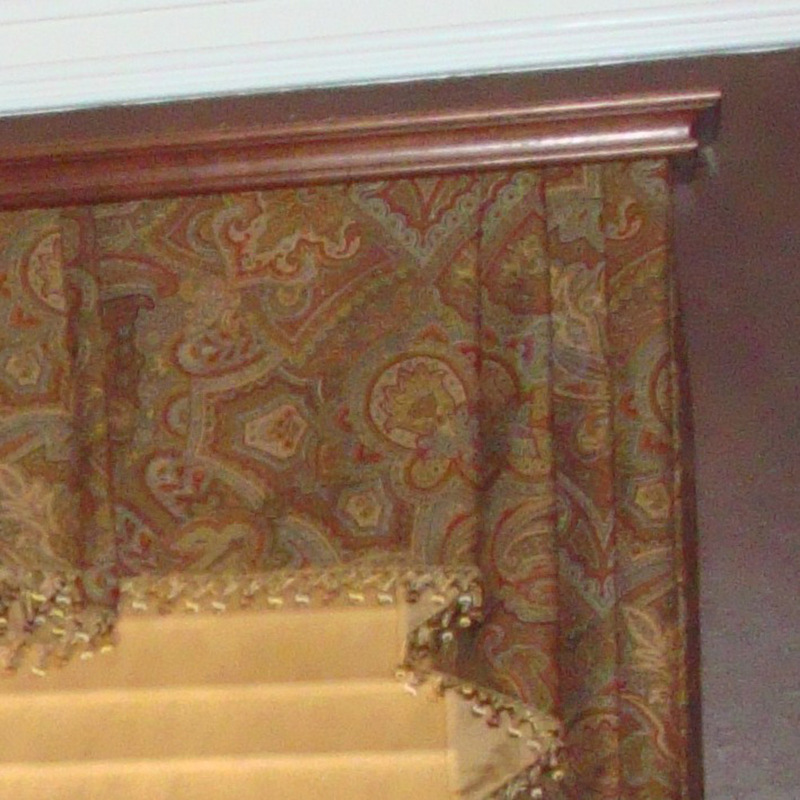 Just add a strand of tassel fringe (instead of pearls) to complete the look! 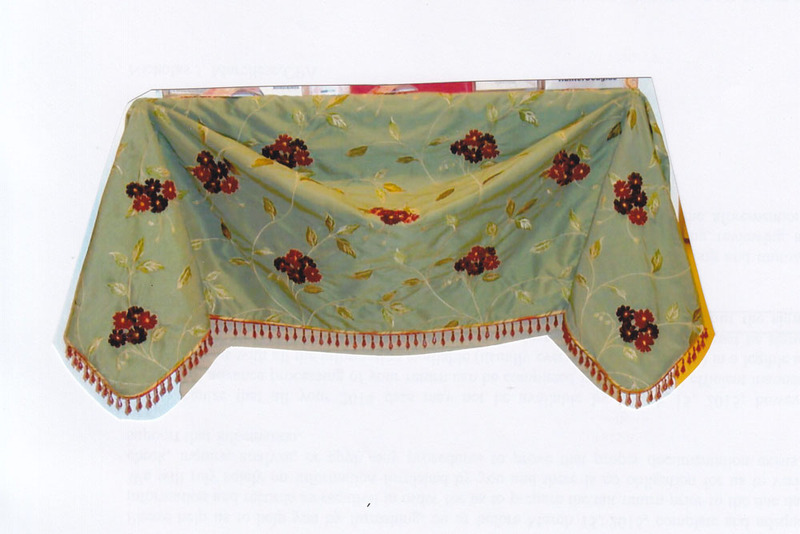 Casual Swags are wrapped as one piece of a fabric for a more casual appearance. 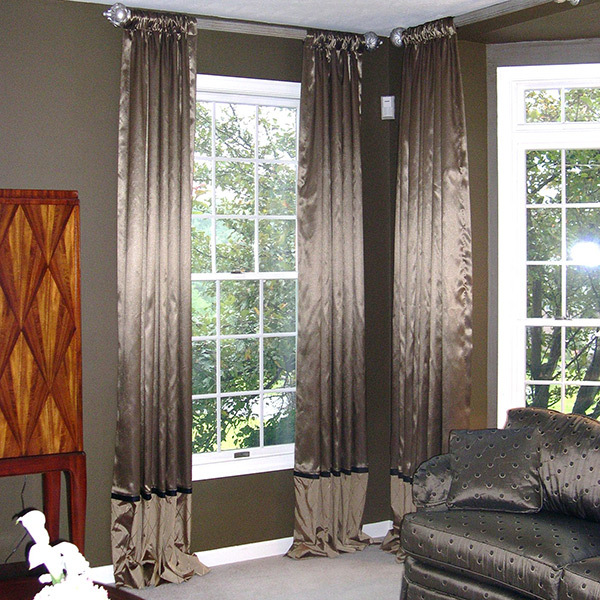 The fabric choice will ultimately define the style of the room. 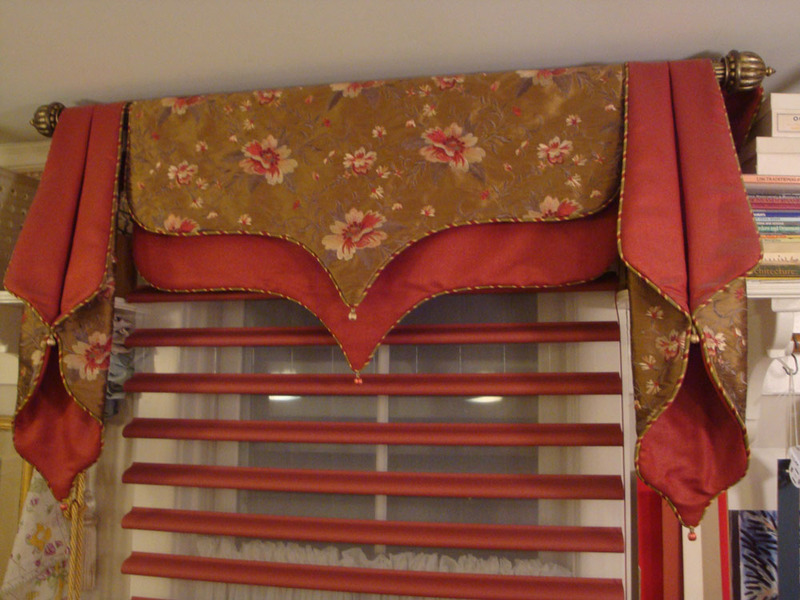 Traditional Draw Draperies (Curtains) are pleated to create fullness and can traverse open and closed. 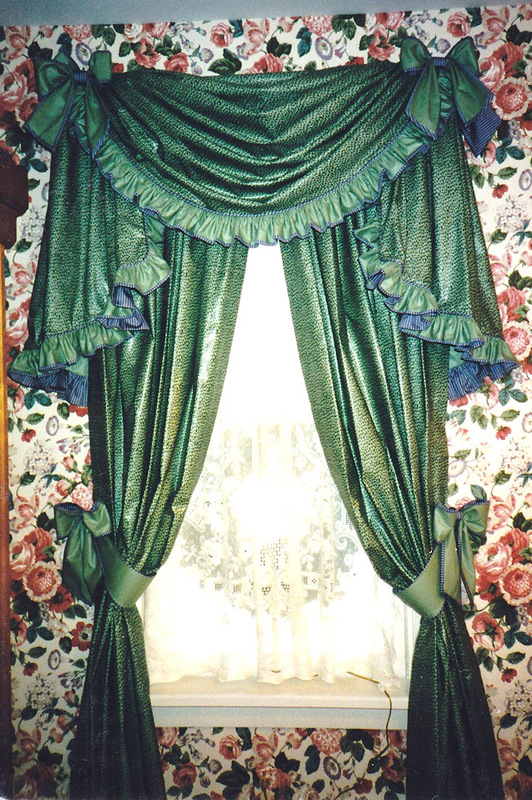 Some of the commonly used pleating techniques are pinch pleats, French pleats, goblet pleats, and Bohemian pleats. 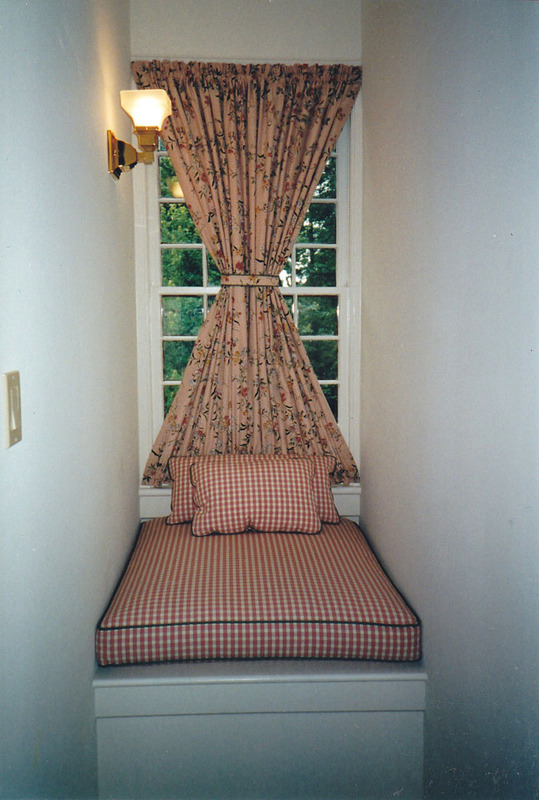 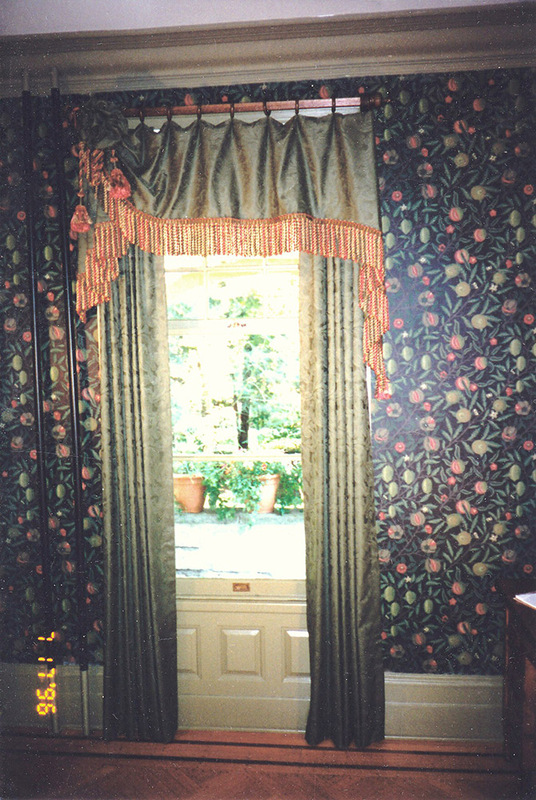 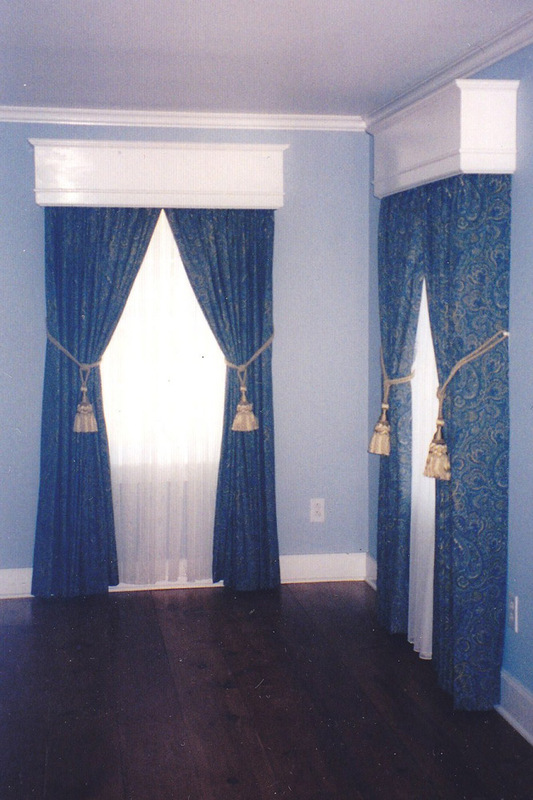 Modern Draw Draperies (Curtains) are constructed flat. 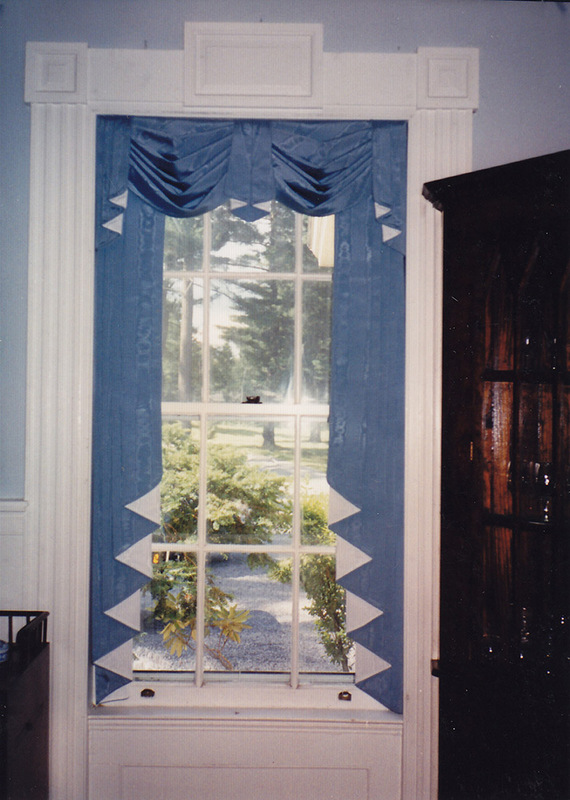 They use special hardware and tape to create modern fullness and can traverse open and closed. 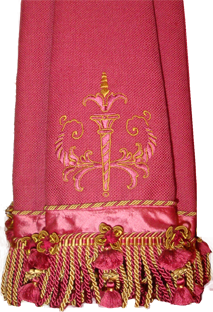 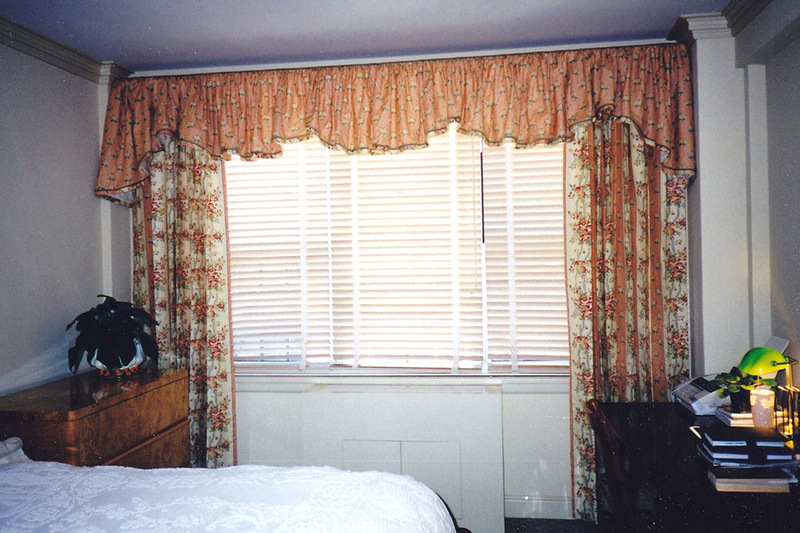 This type of drapery may also be referred to as ripple-fold or roll-pleat drapes. 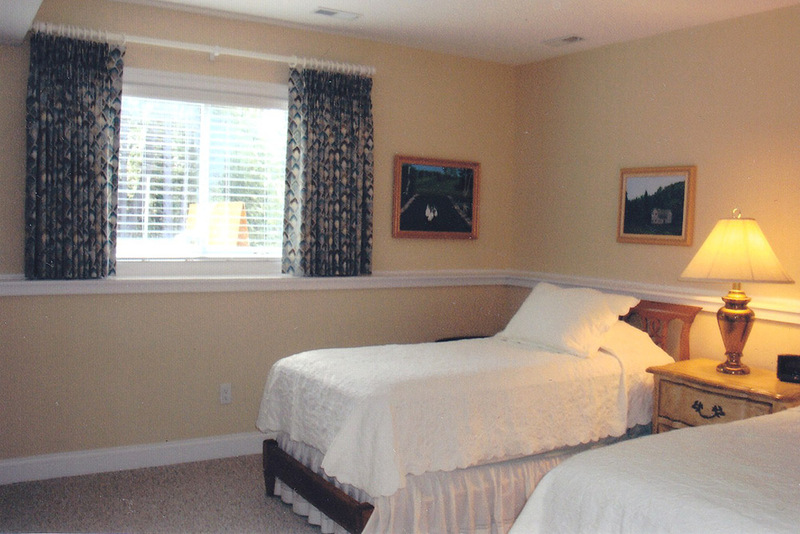 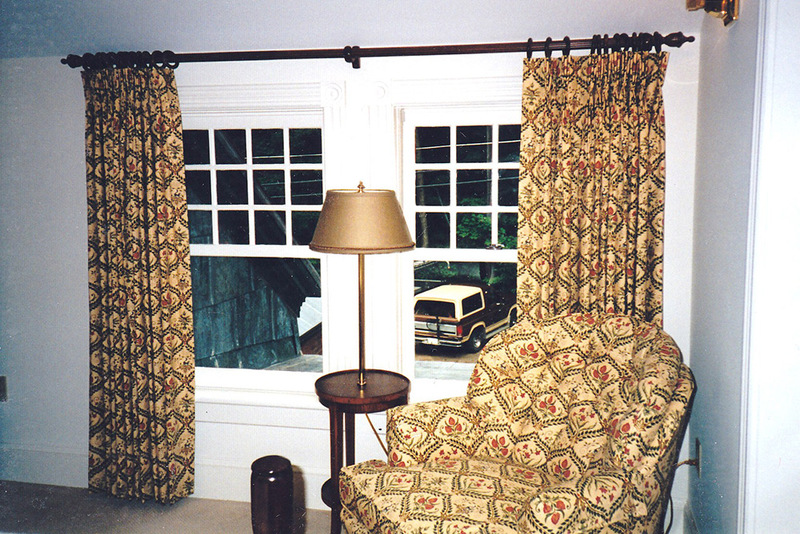 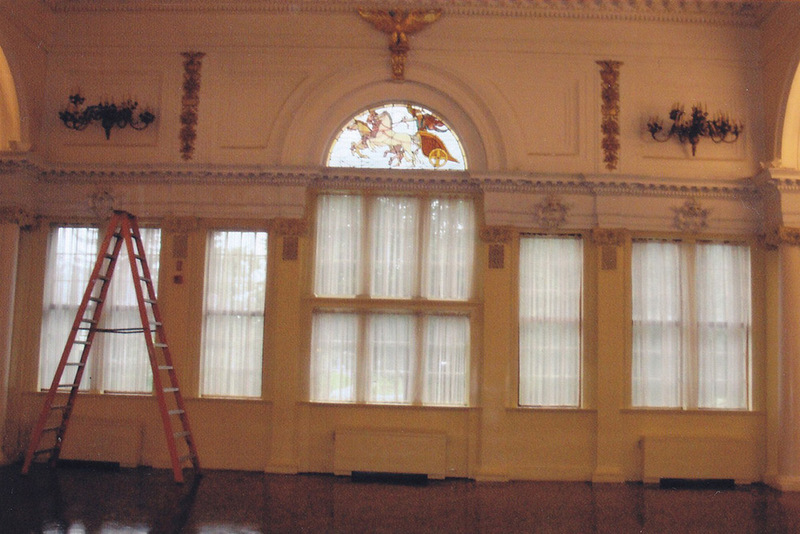 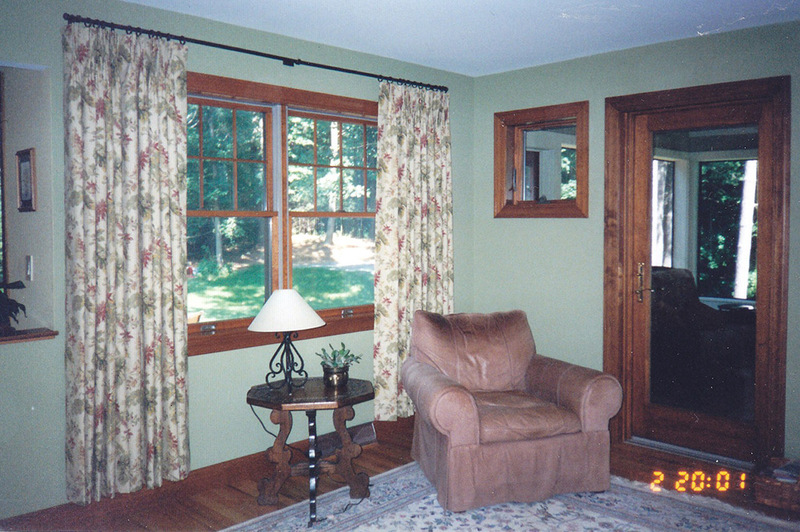 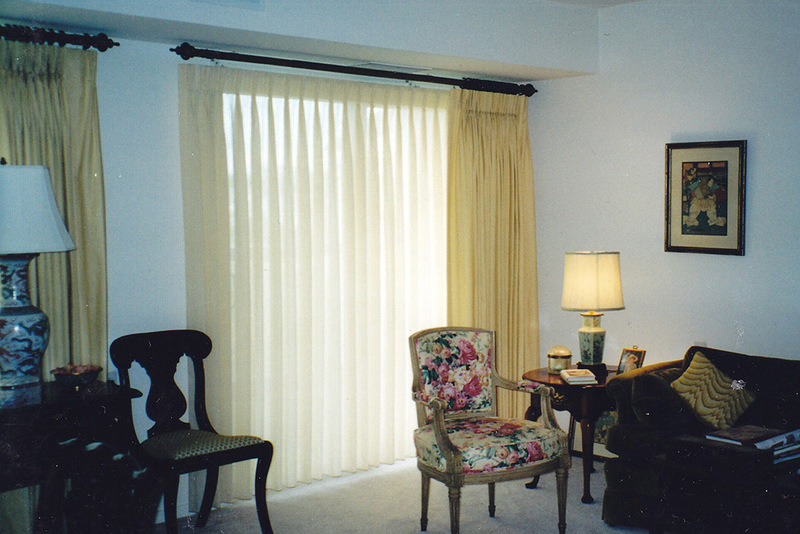 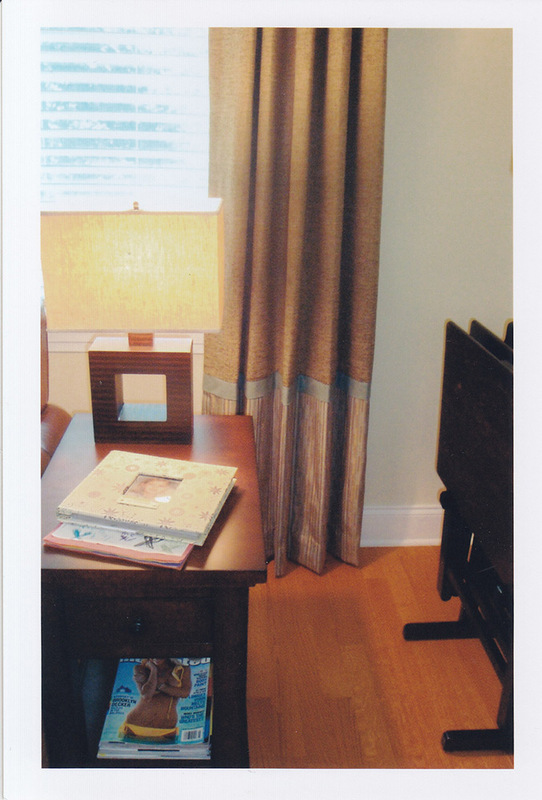 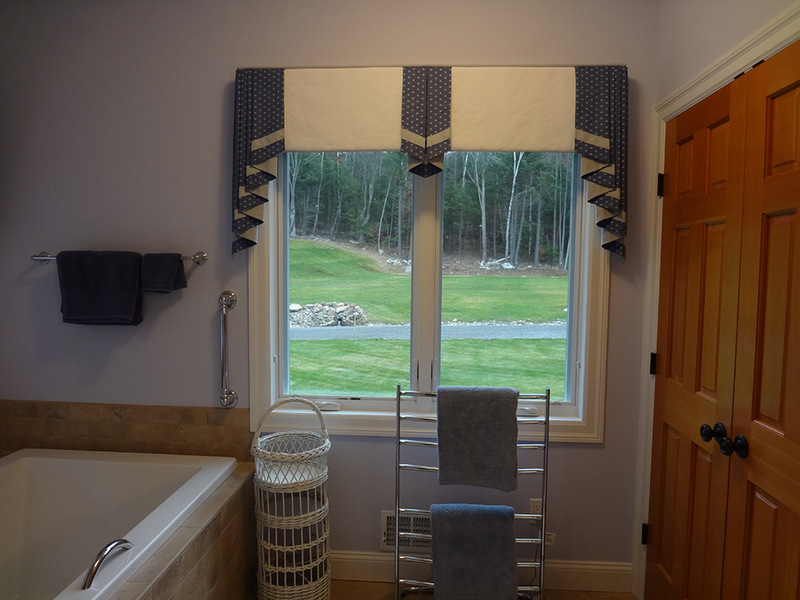 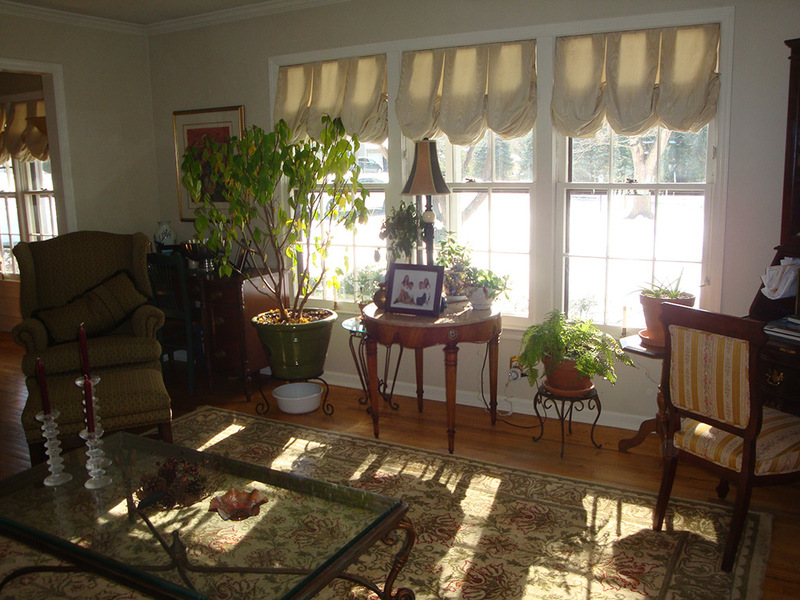 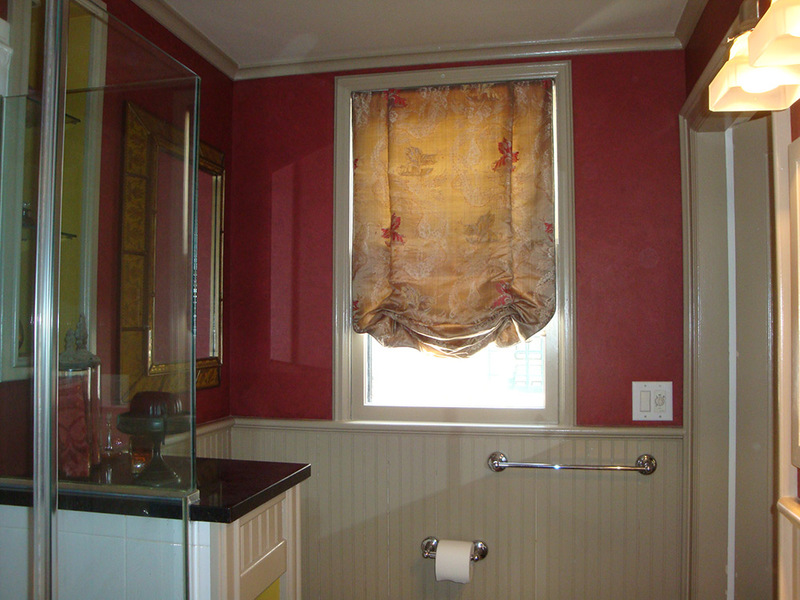 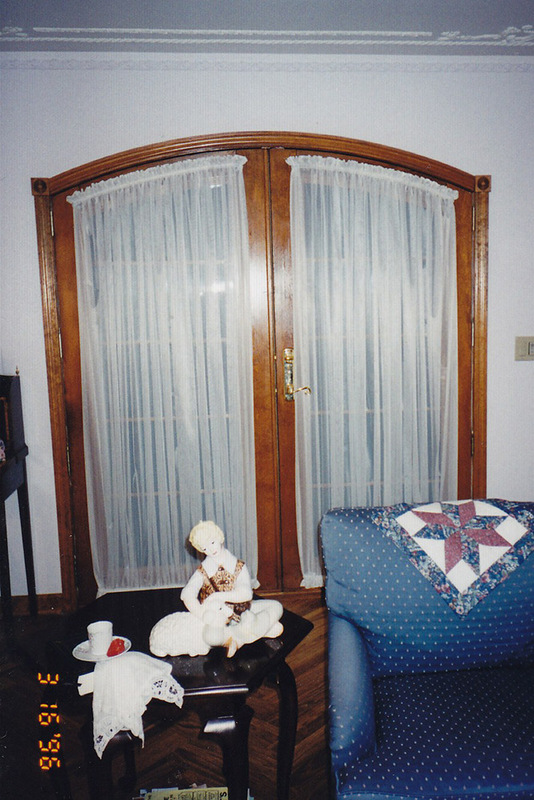 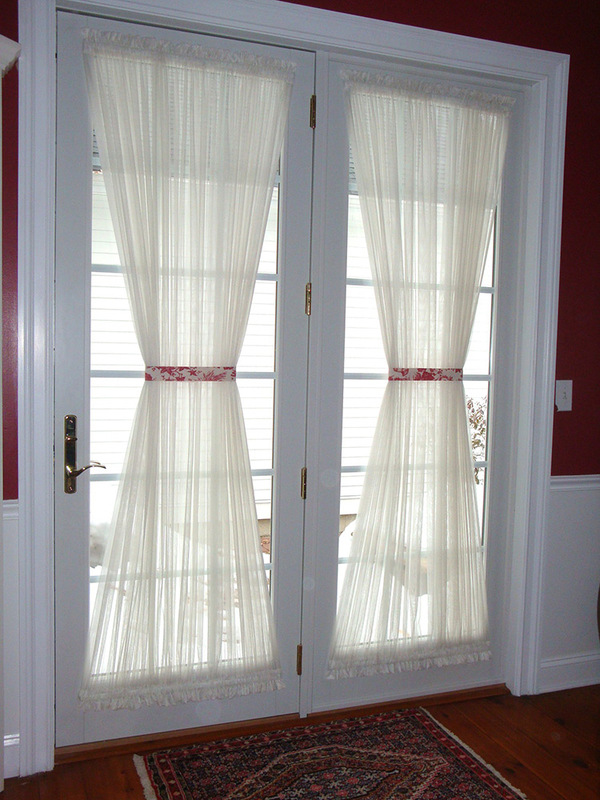 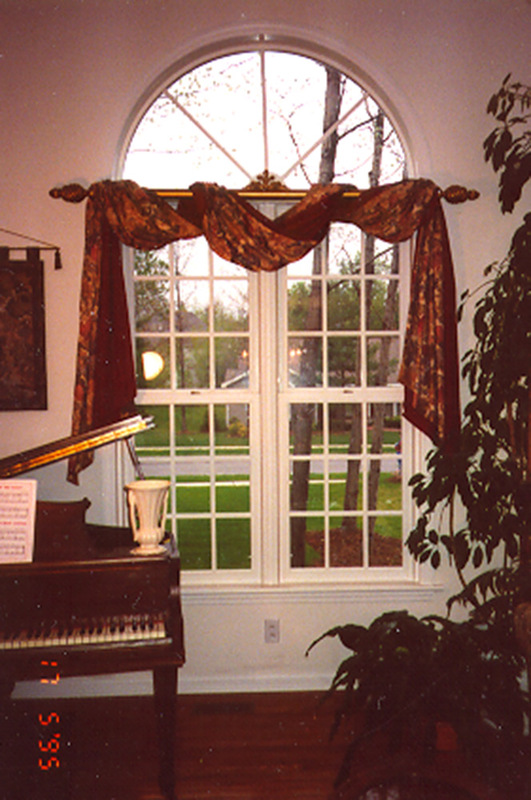 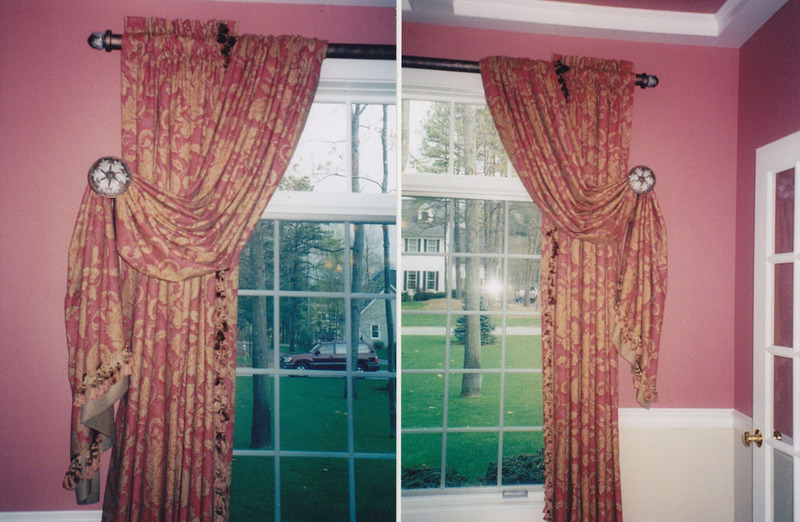 Stationary Drapery Panels are designed to frame your window but do not open and close. 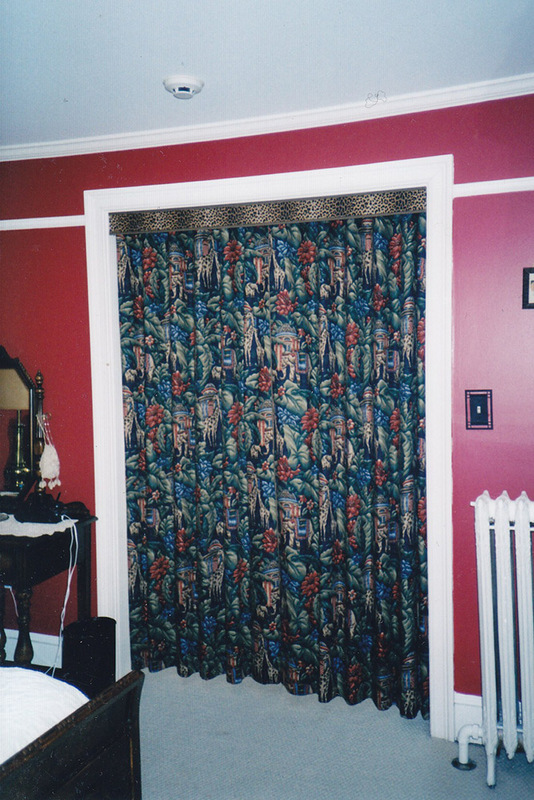 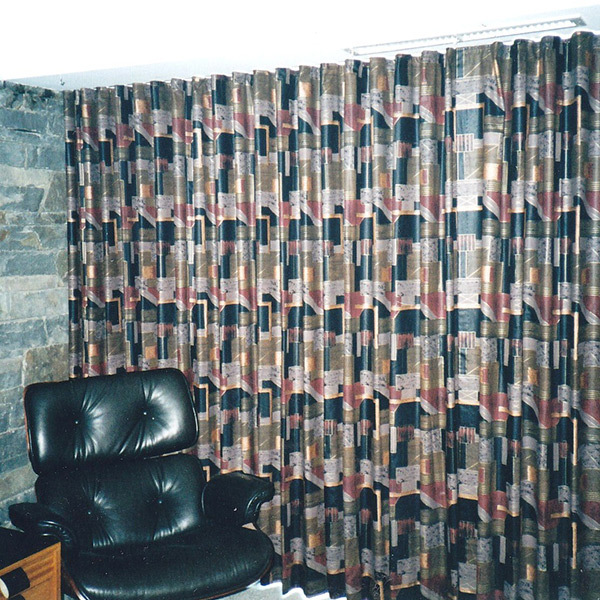 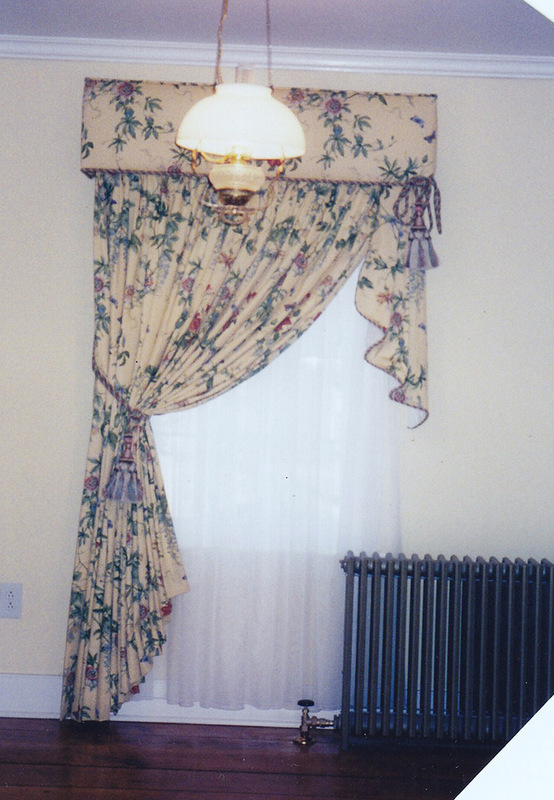 Any type of drapery or curtain can be a stationary panel. 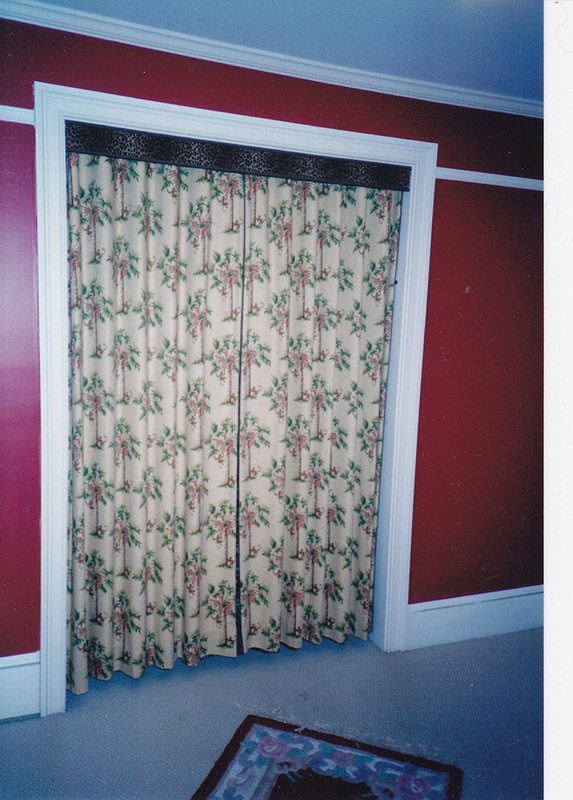 Some common names for stationary panels are rod pocket, tab top, and grommet panels. 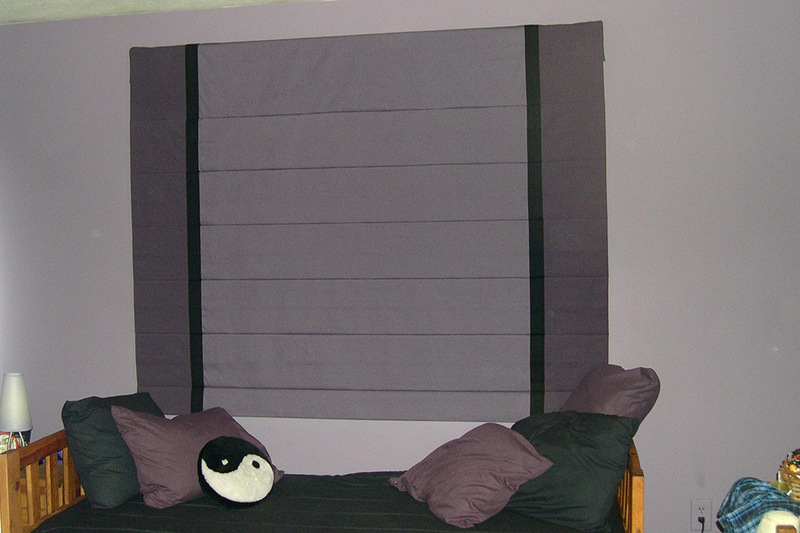 Any pleated drape can also be a stationary panel. 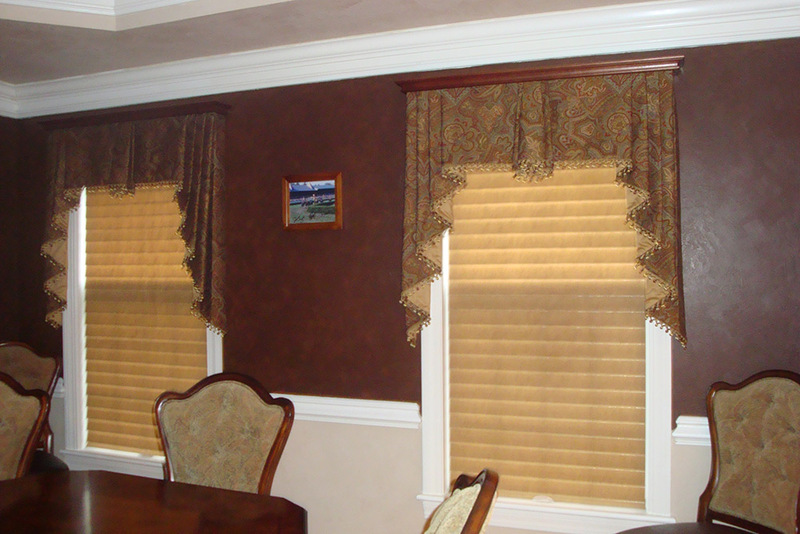 Tailored Pleated Valances have straight clean lines. 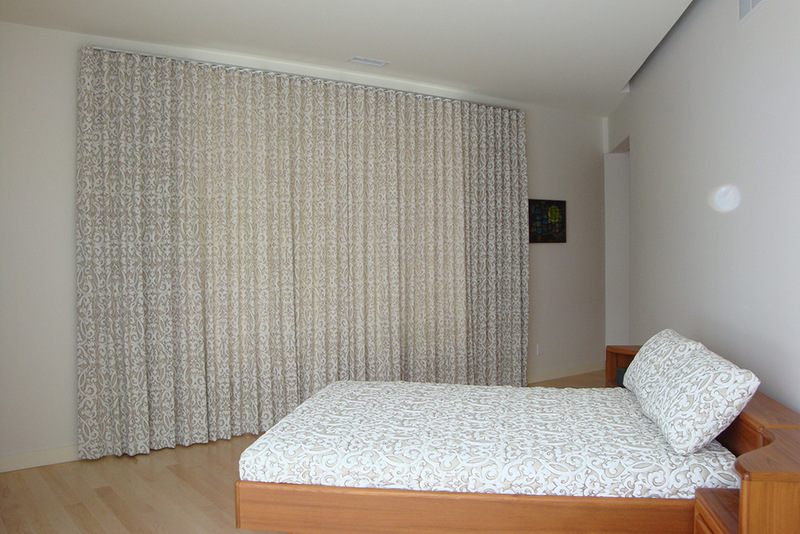 The basic simplicity can stand on its own or lend itself to further creativity. 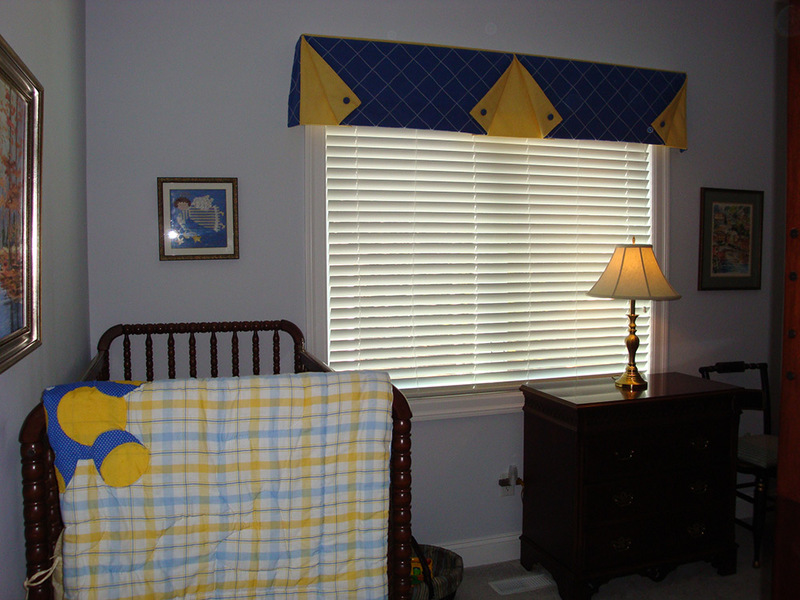 Multiple fabrics can be used together as well as incorporating additional design elements such as jabots, tabs, and decorative hardware. 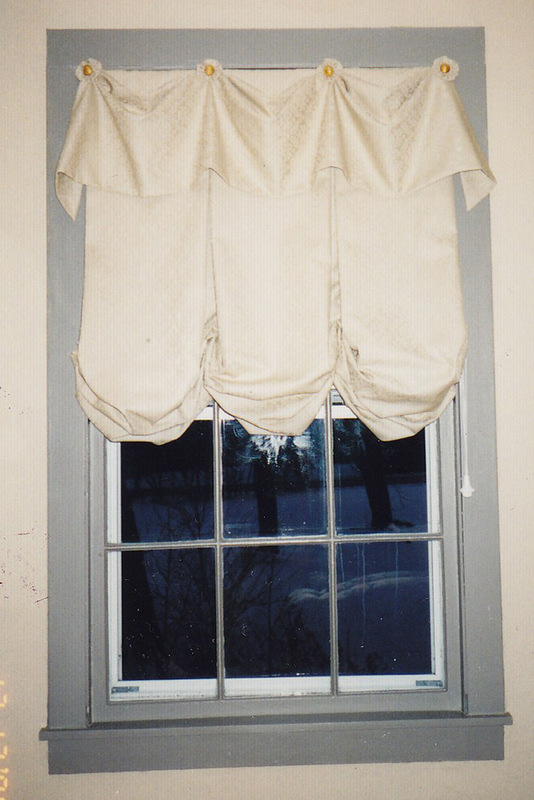 Gathered Valances have billowy fullness. 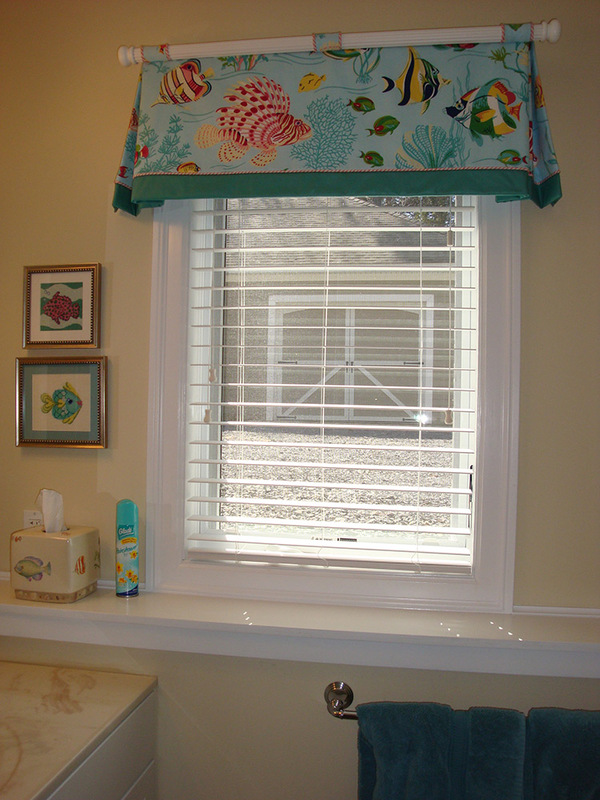 They are considered a simple design if a rod can be slipped into a rod pocket to gather the fullness. 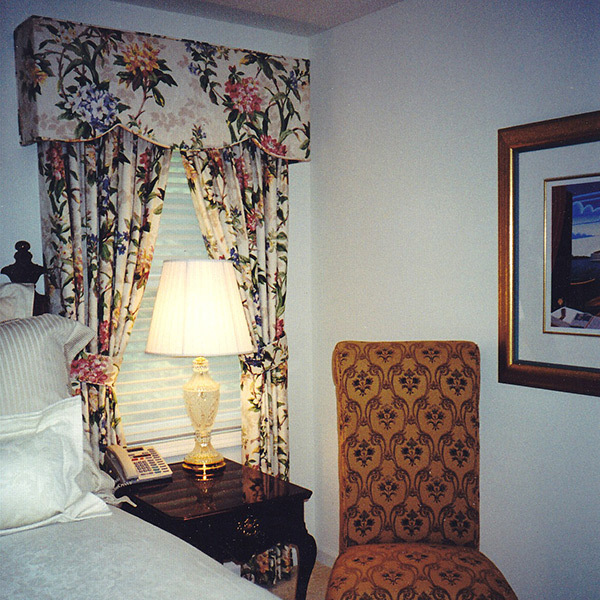 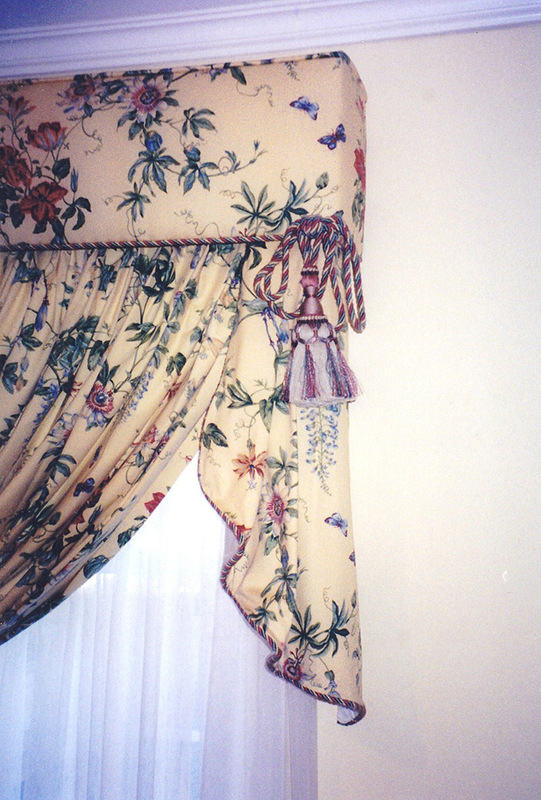 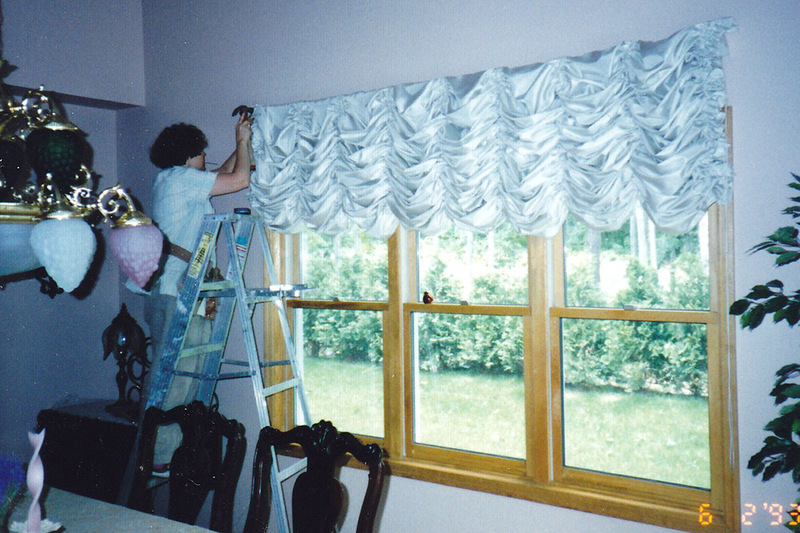 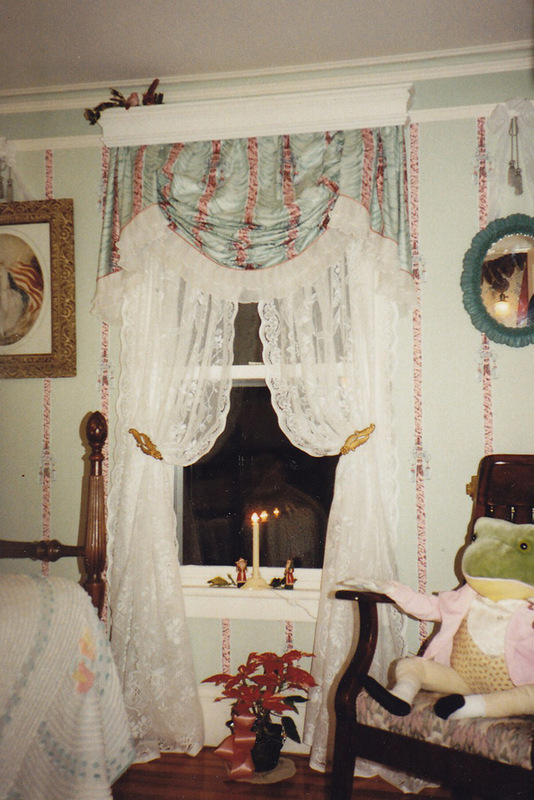 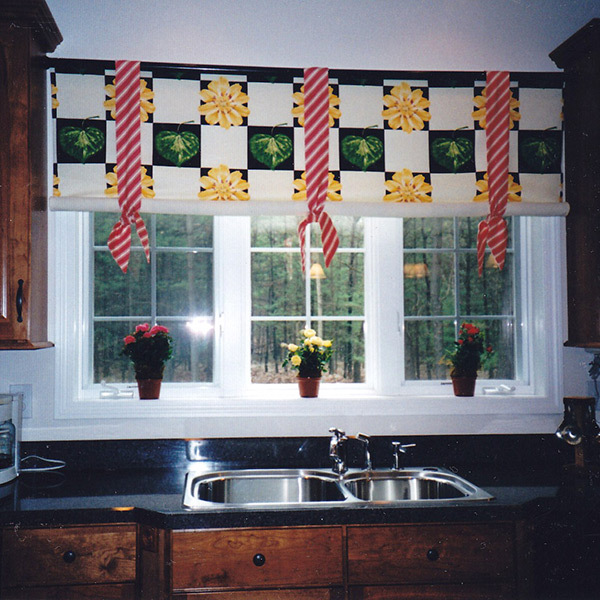 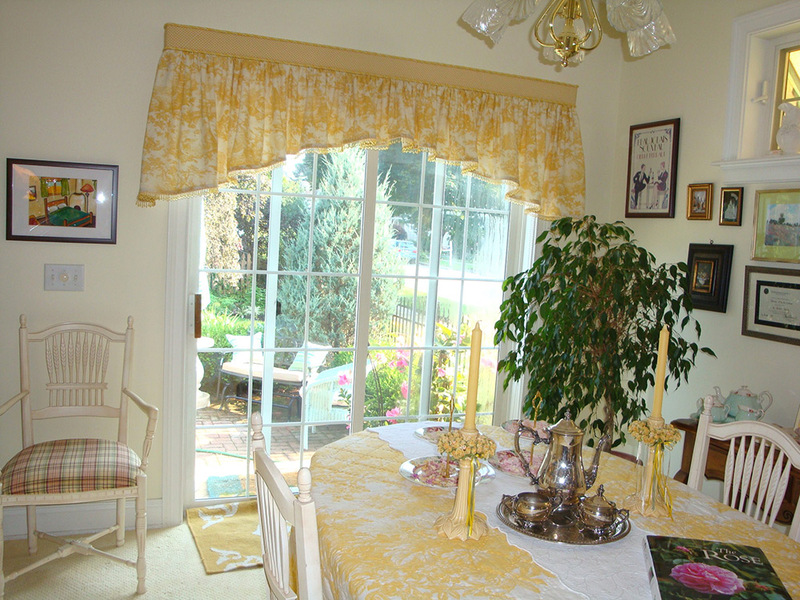 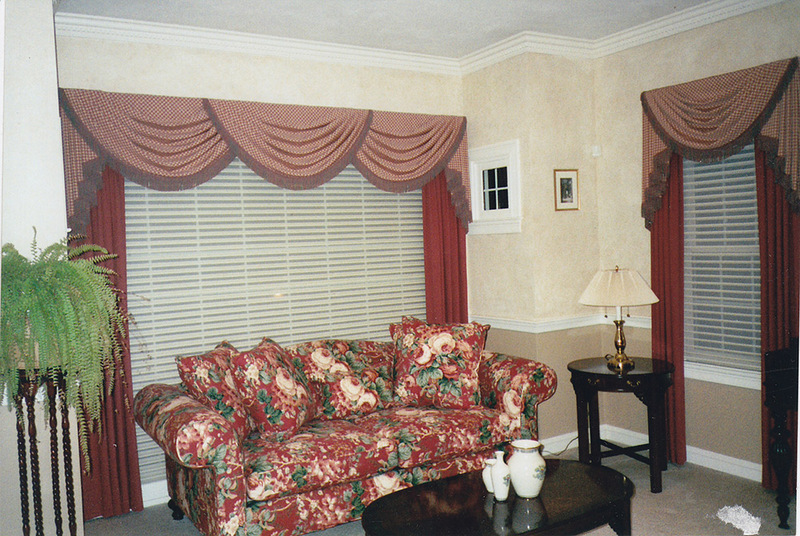 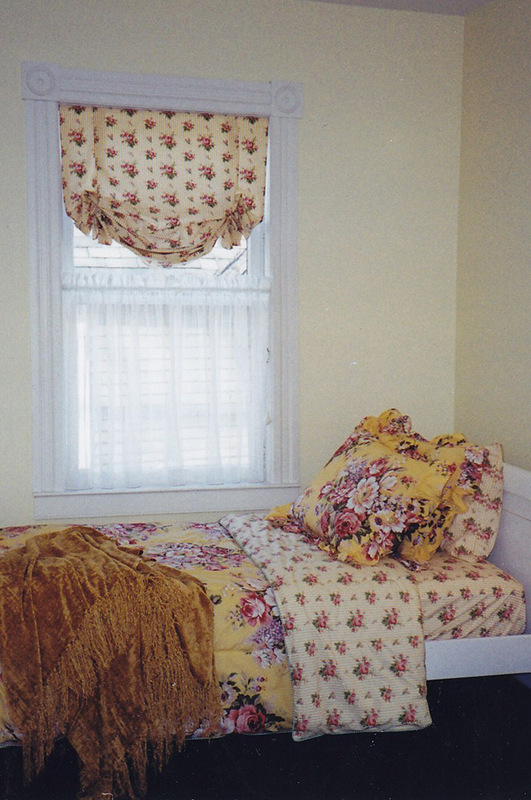 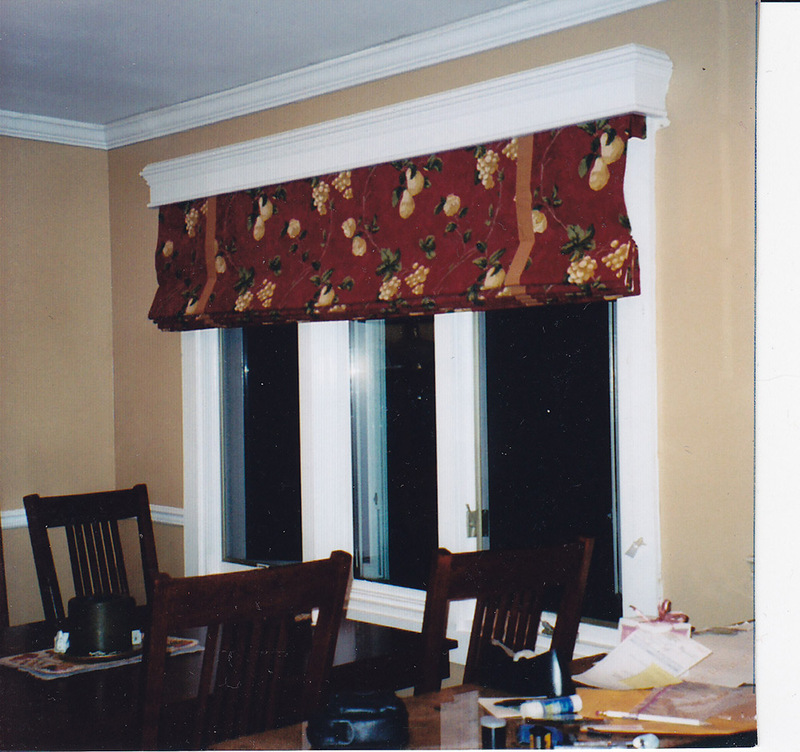 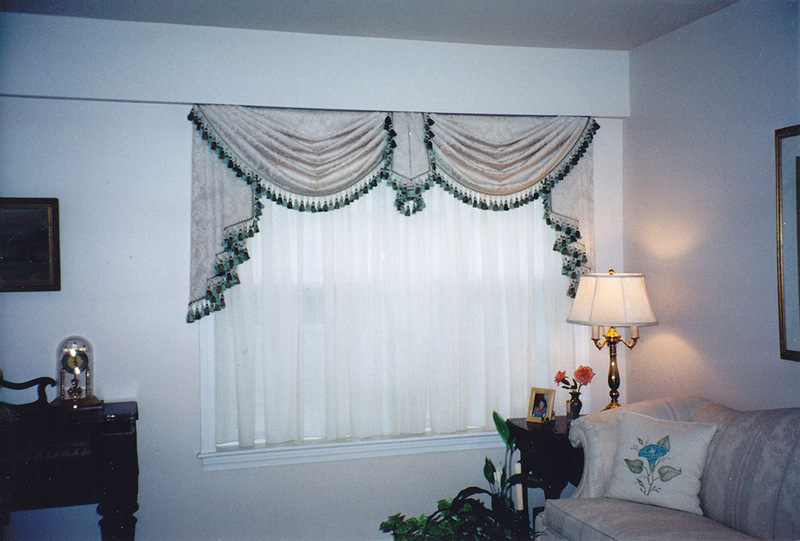 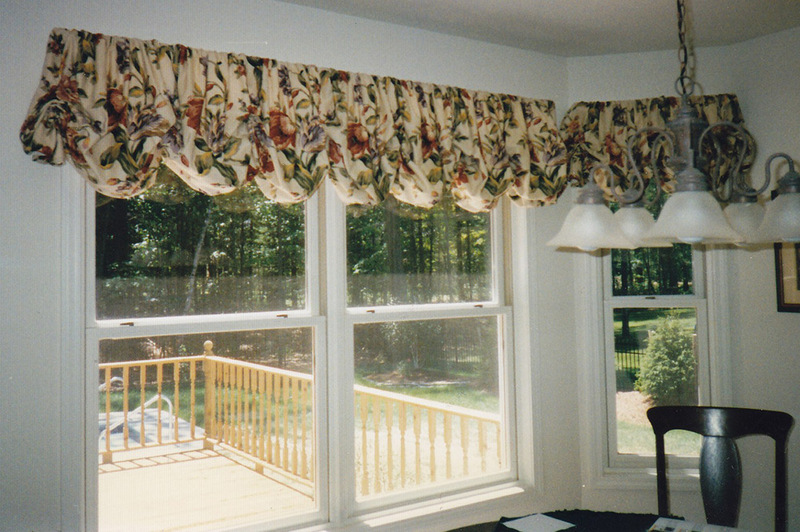 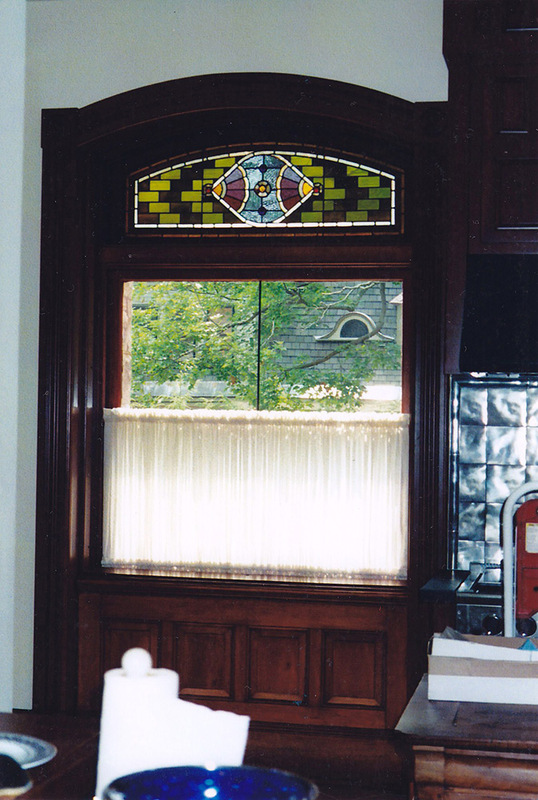 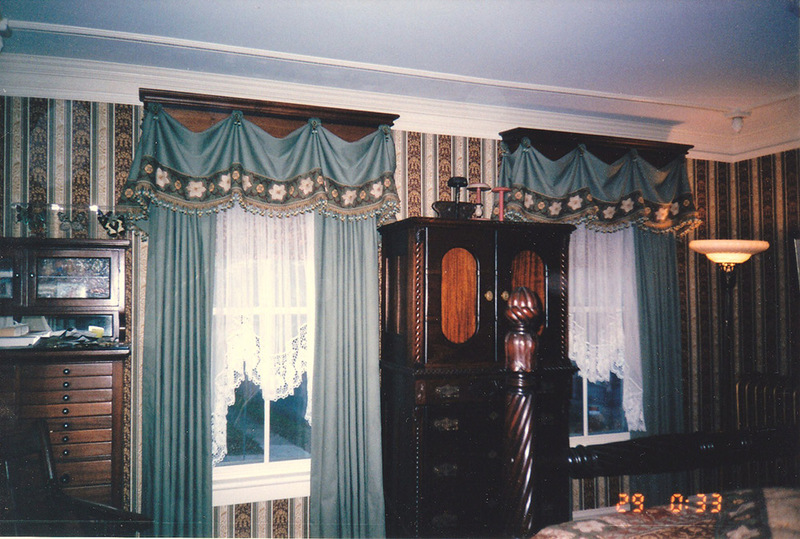 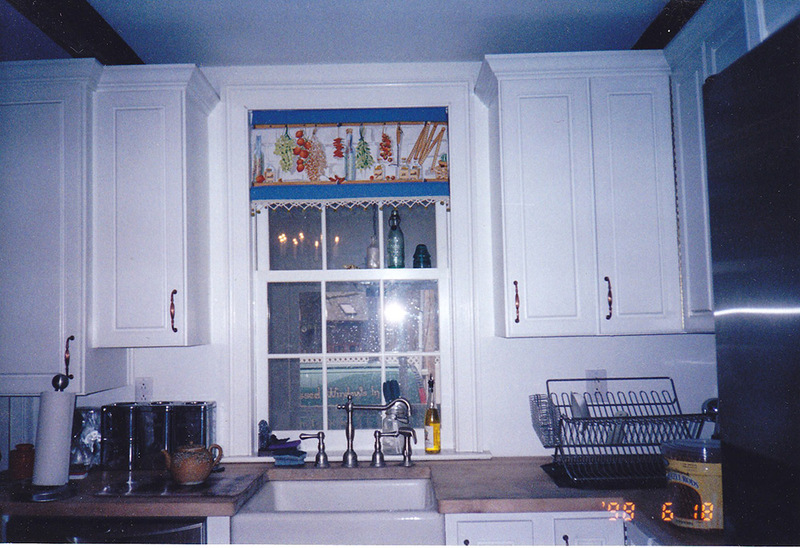 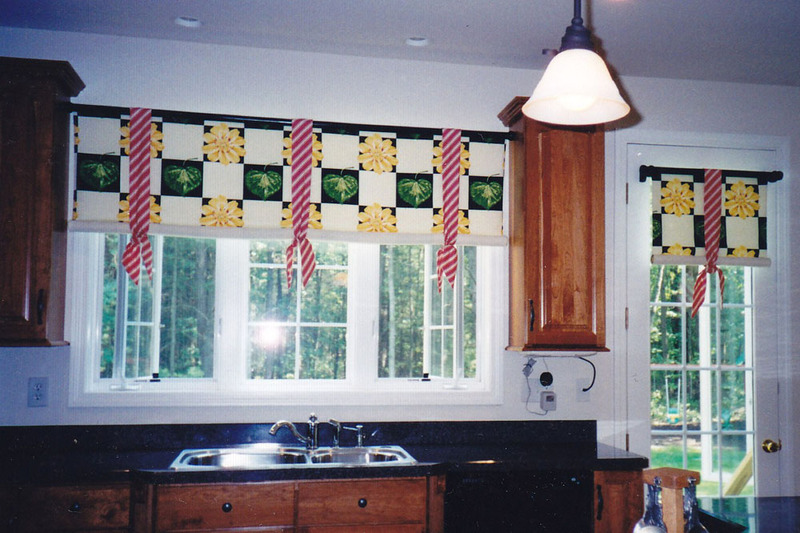 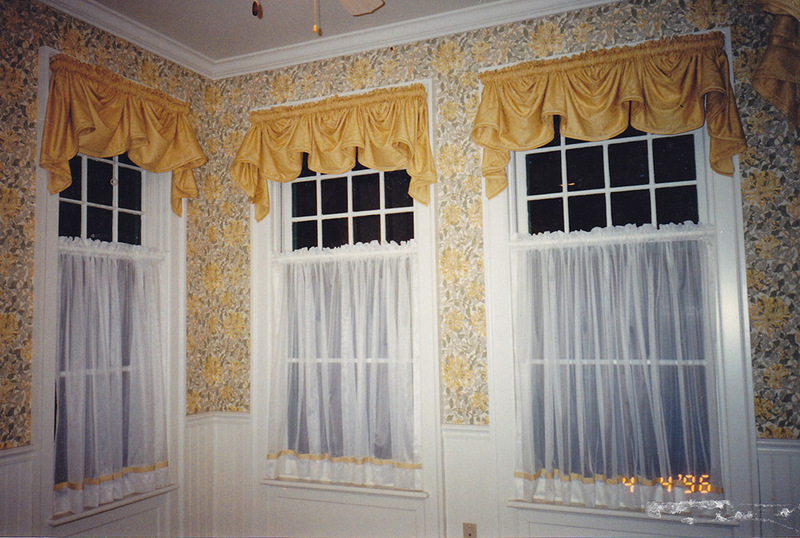 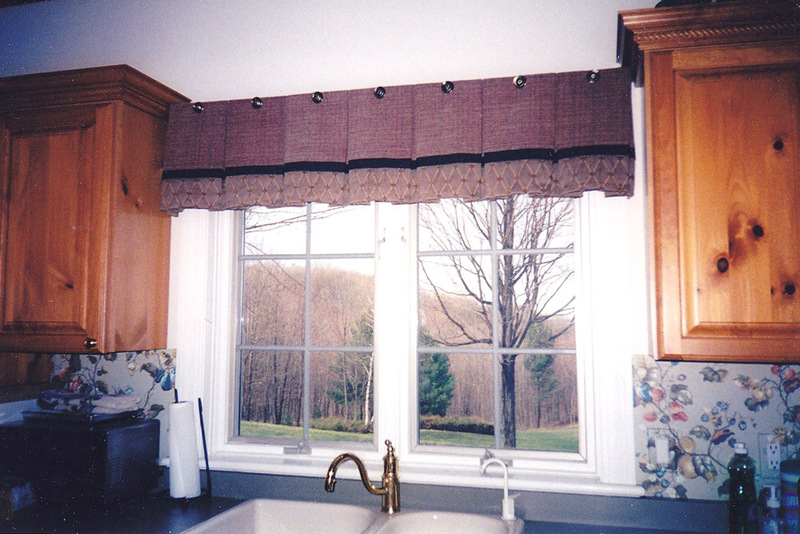 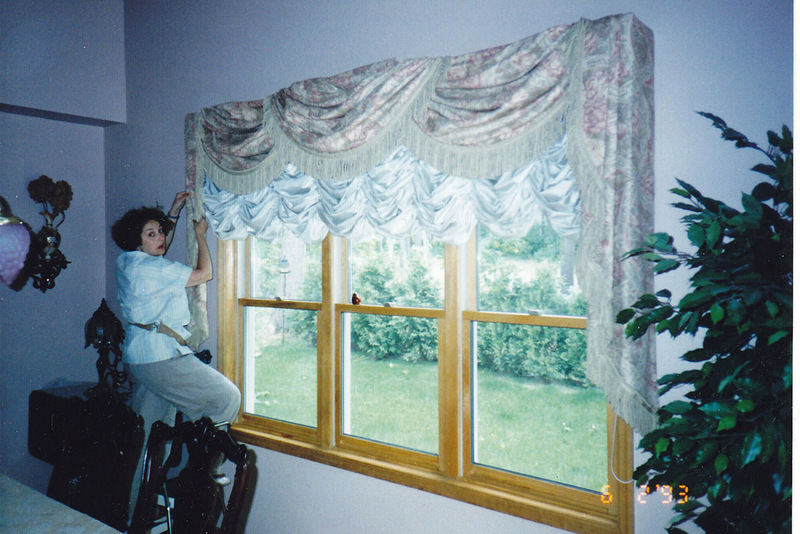 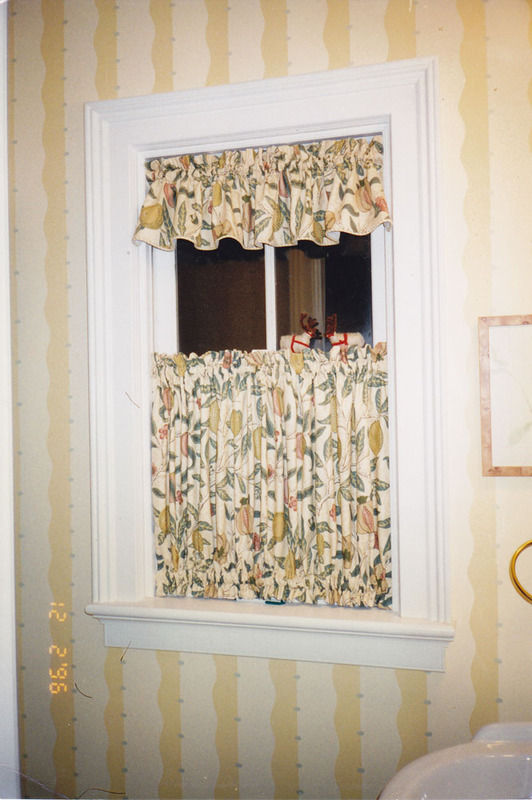 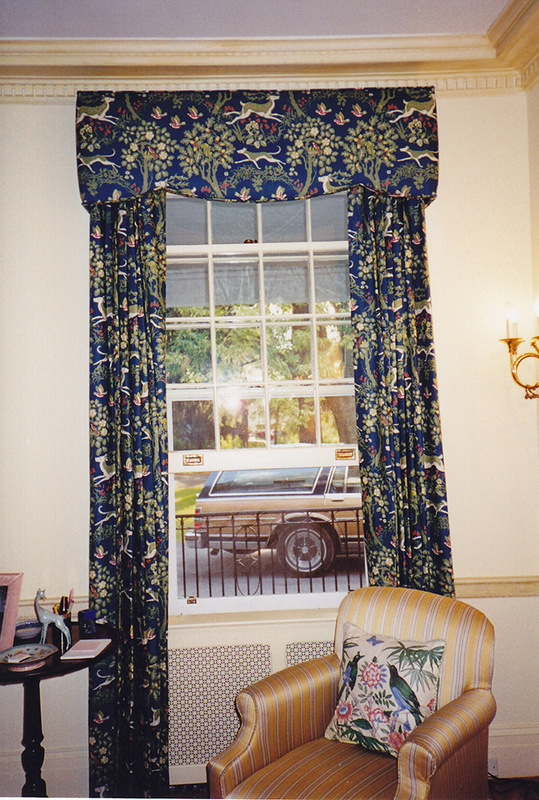 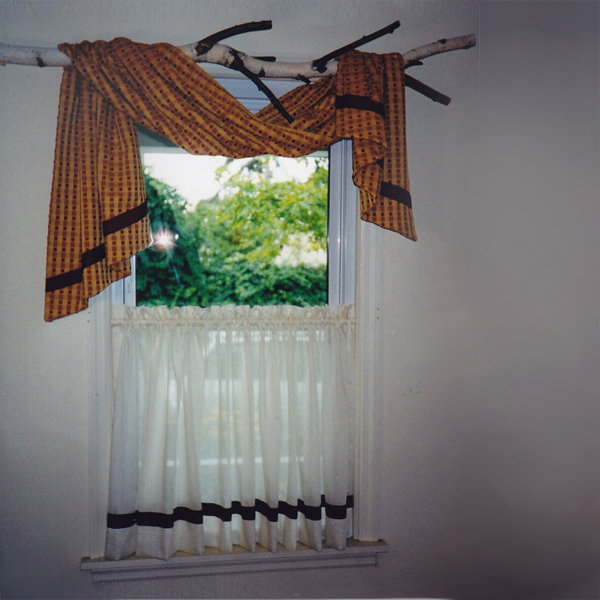 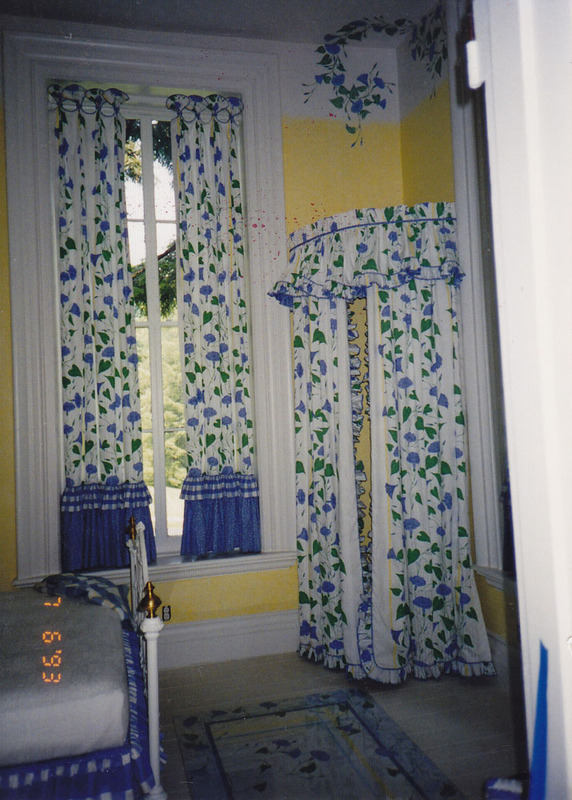 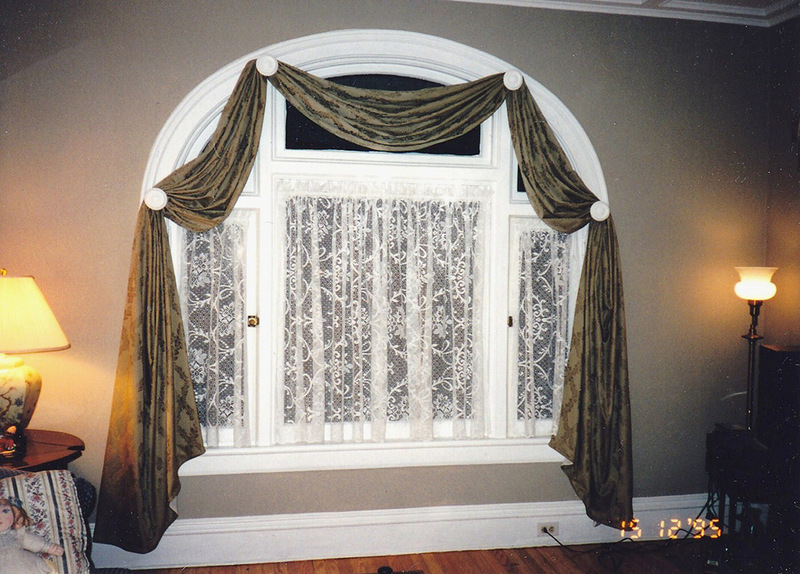 To further embellish this type of valance, details can be added to the top like a medium welt or a cornice cap. 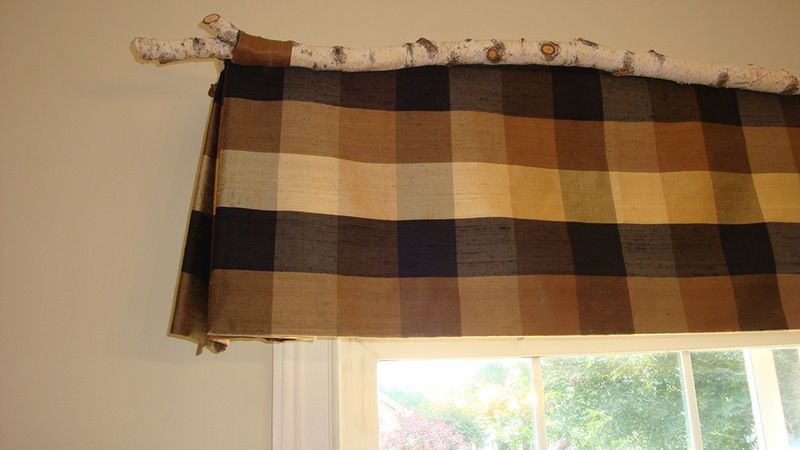 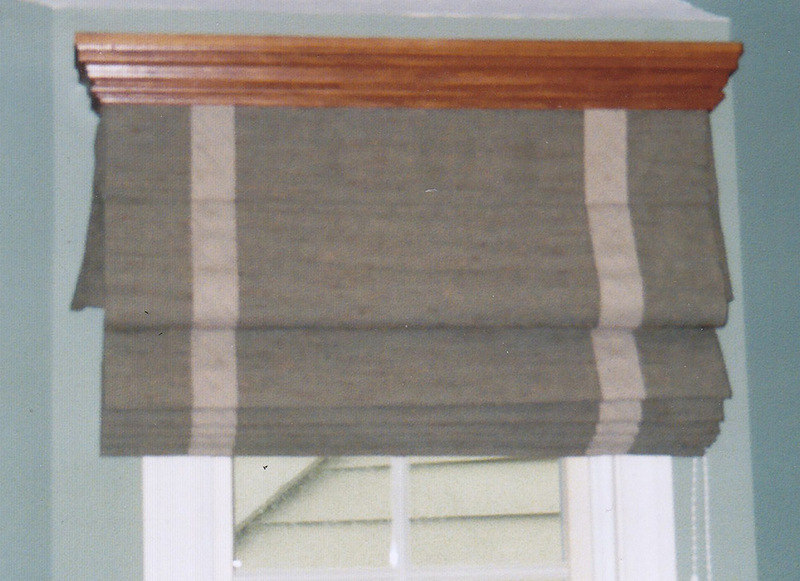 To add these details the valance is attached to a board instead of a rod. 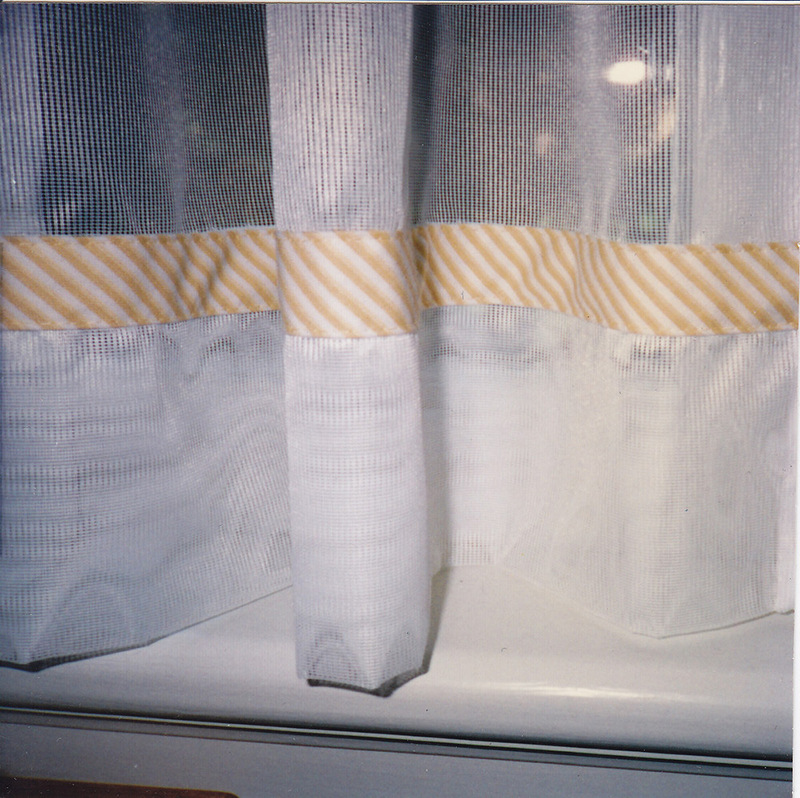 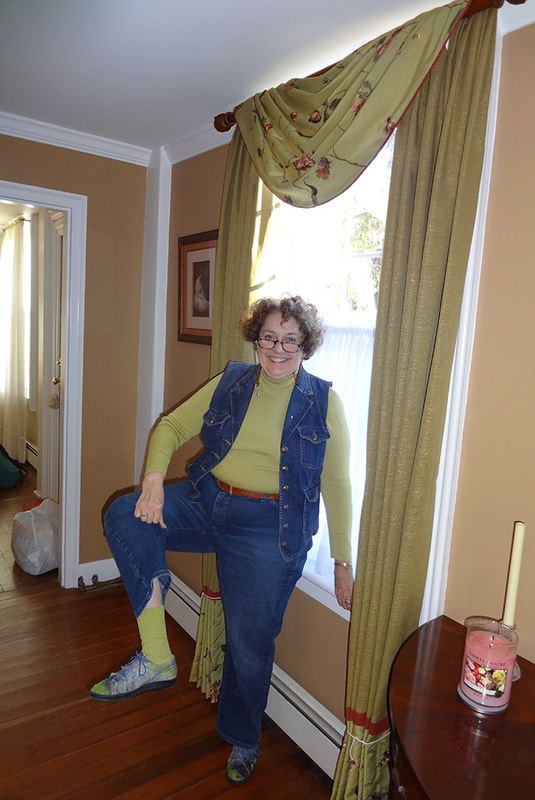 Welting, a flange, or fringe can be added to the bottom hem no matter how it is constructed. 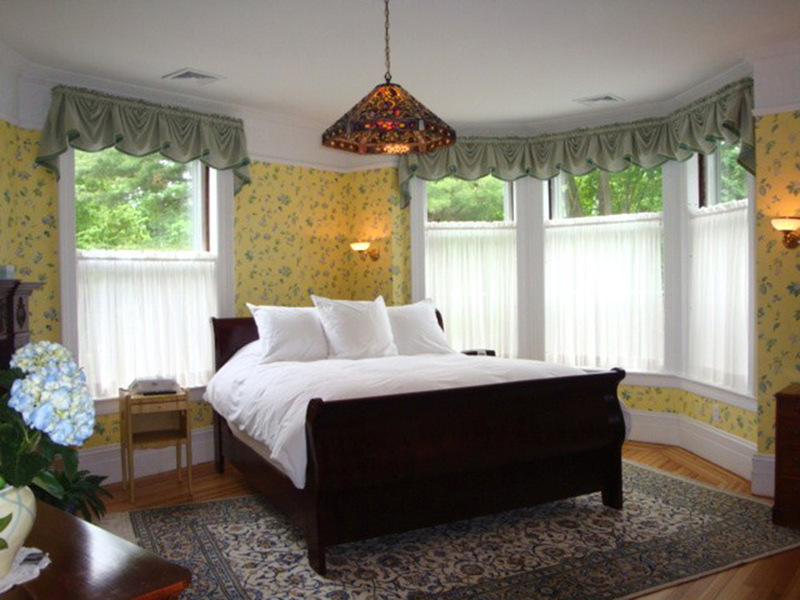 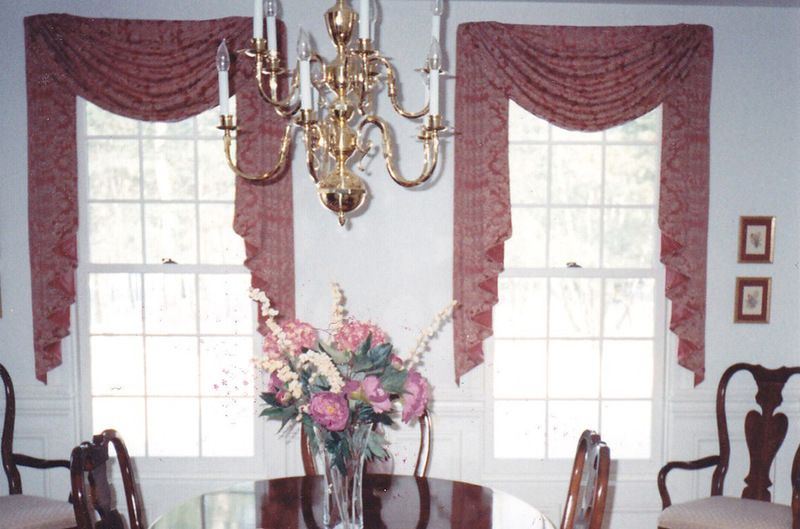 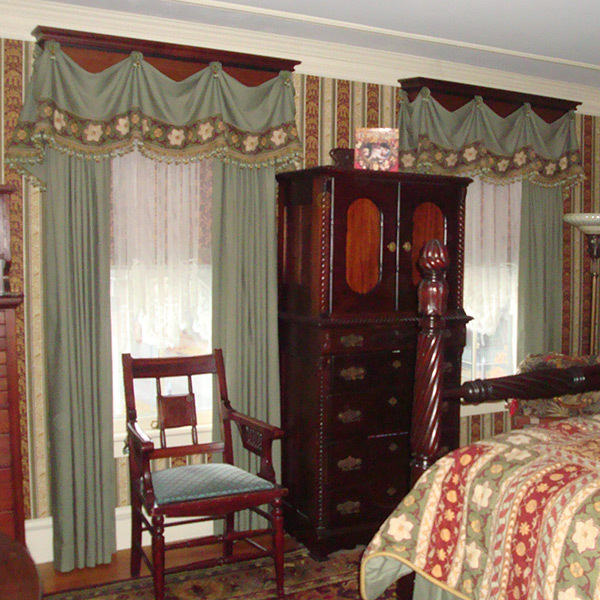 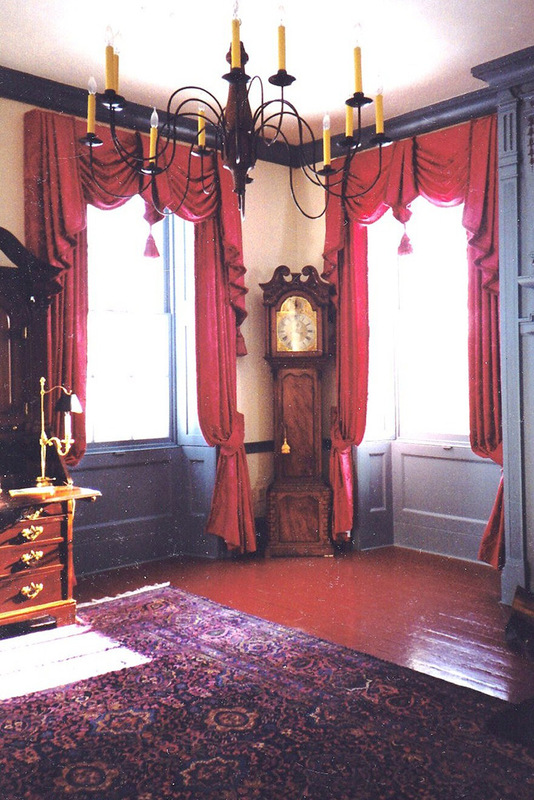 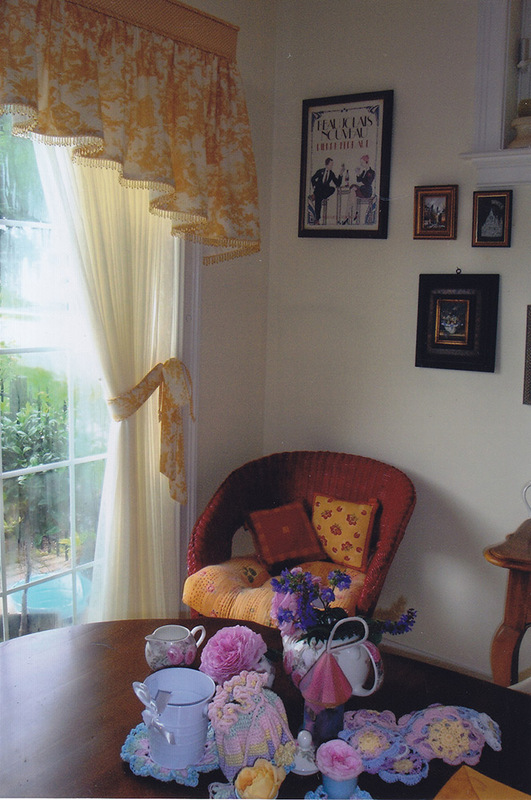 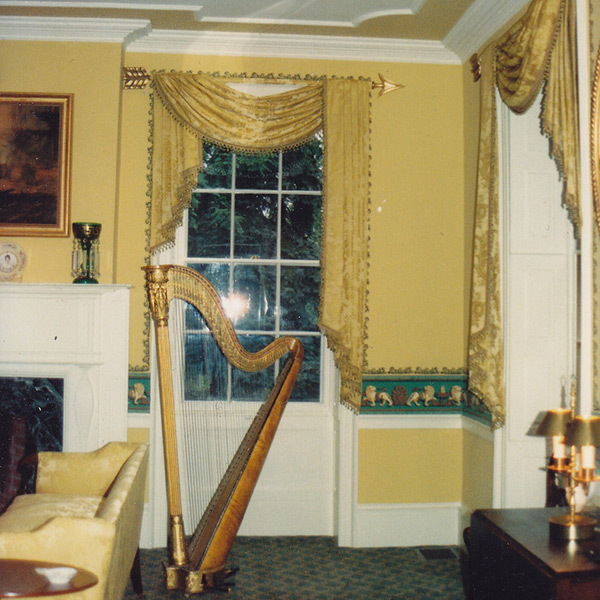 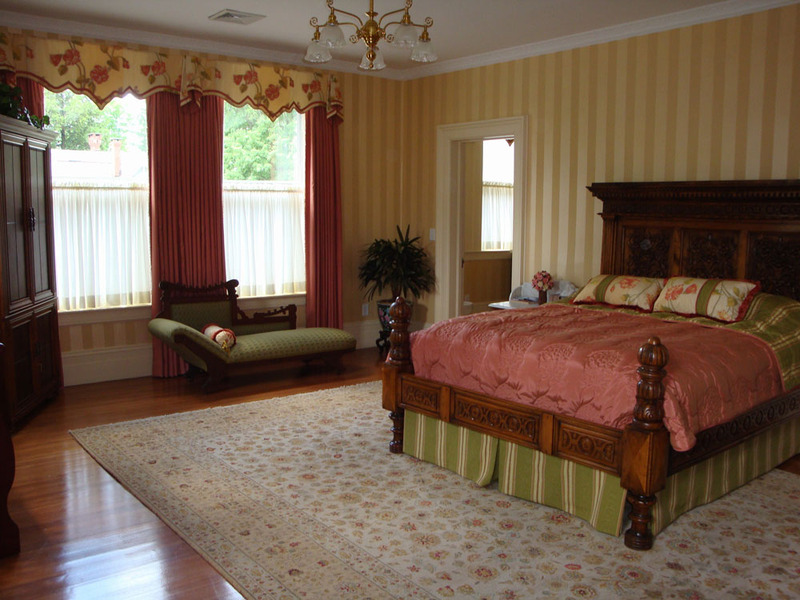 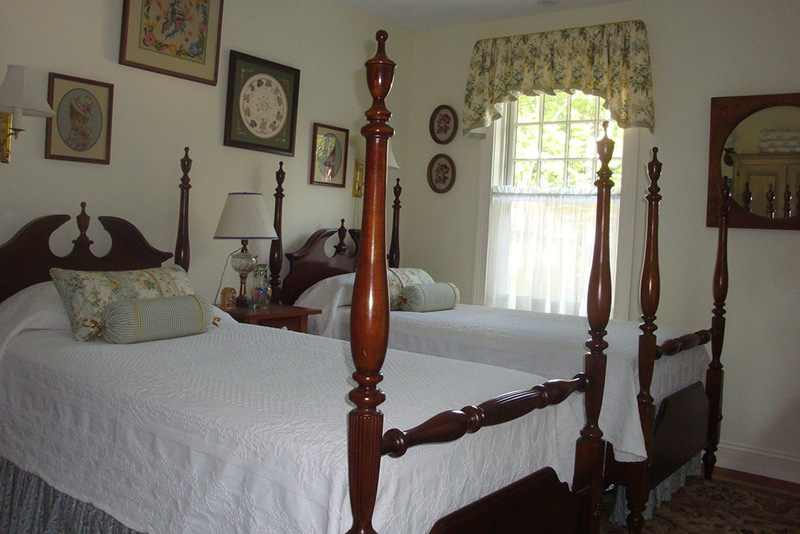 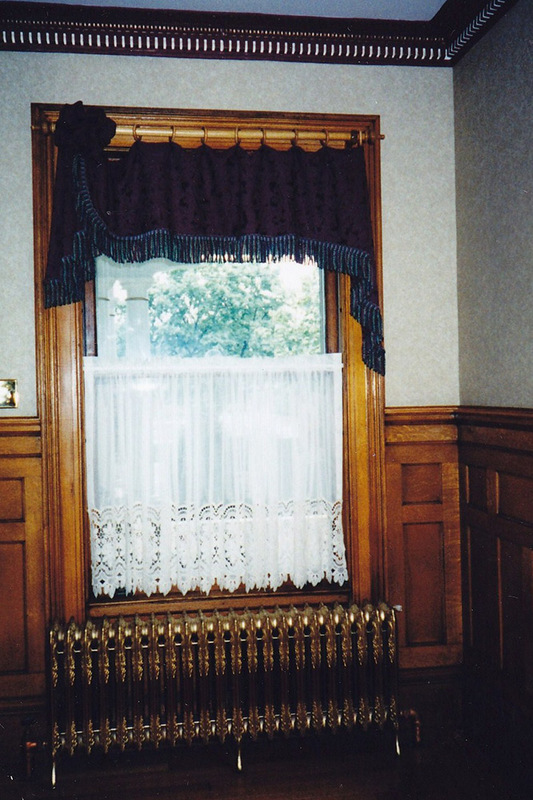 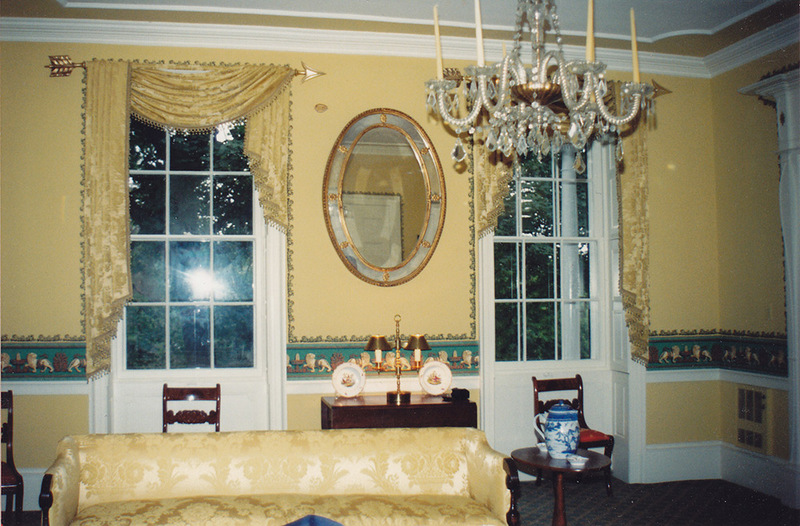 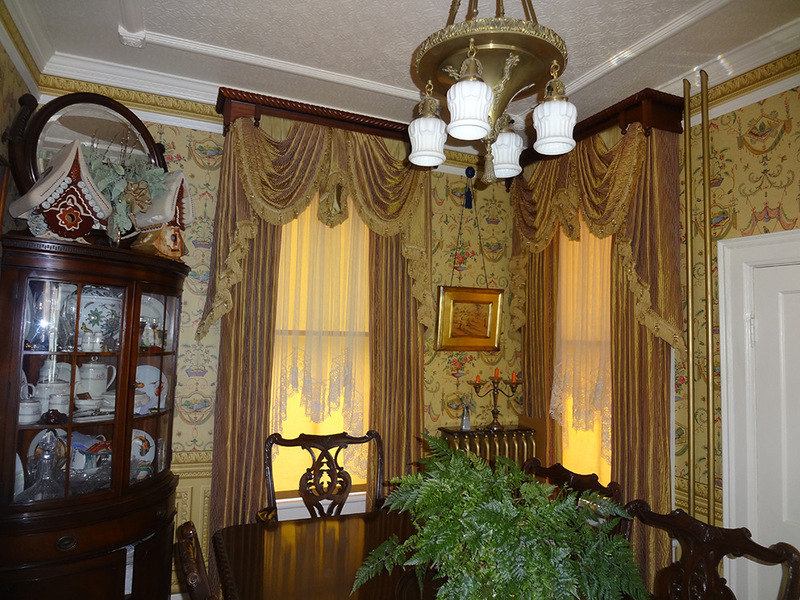 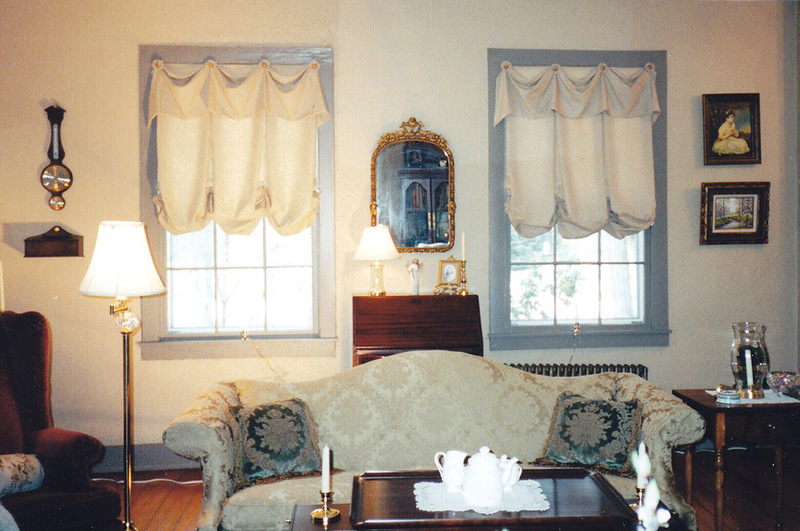 Period-Style Valances are reminiscent of a time gone by. 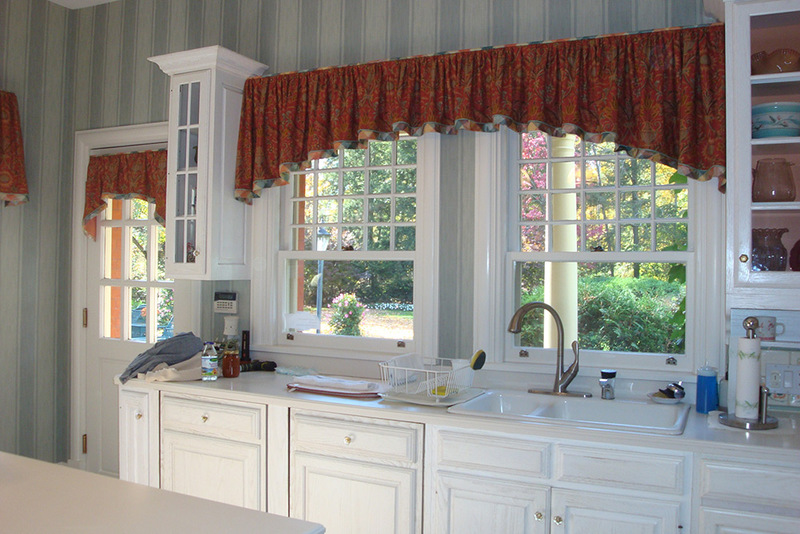 The variations on traditional shapes are endless and can be adapted for a more current look. 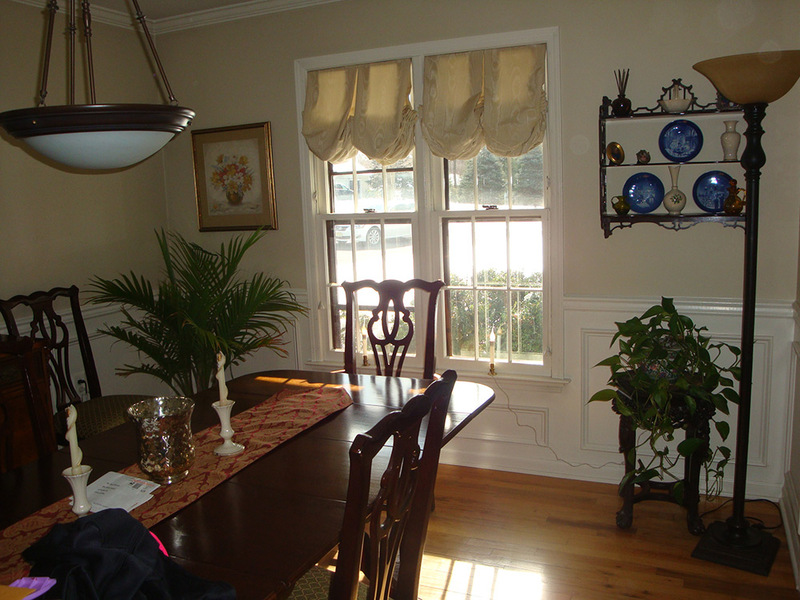 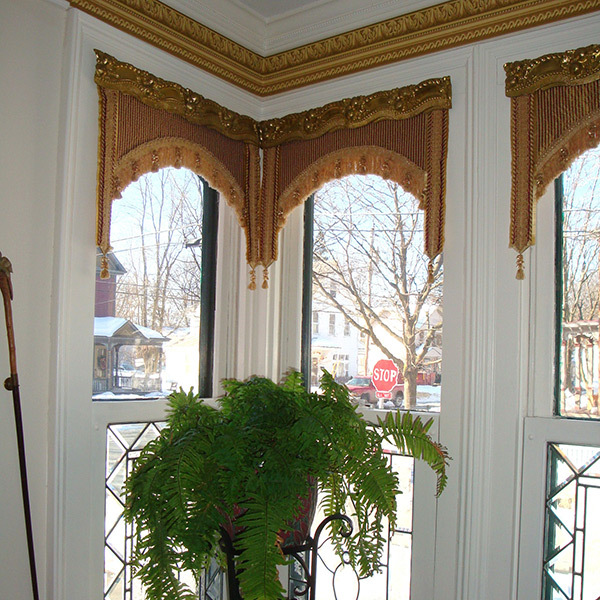 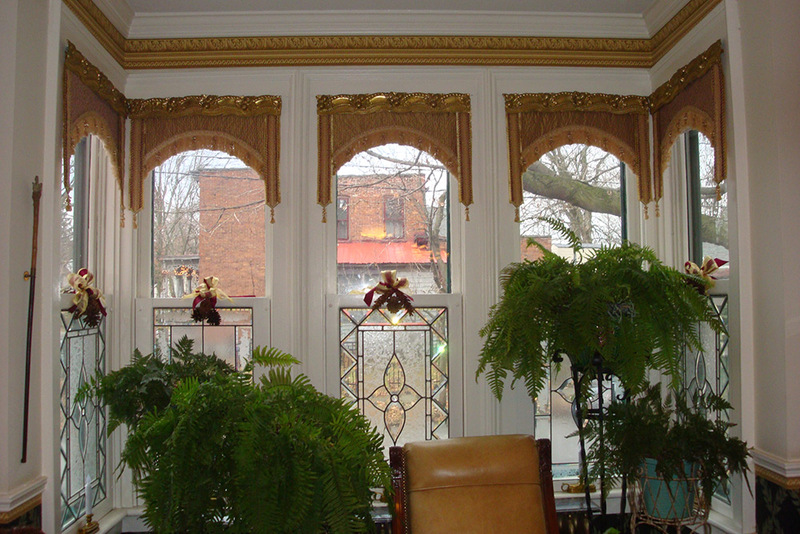 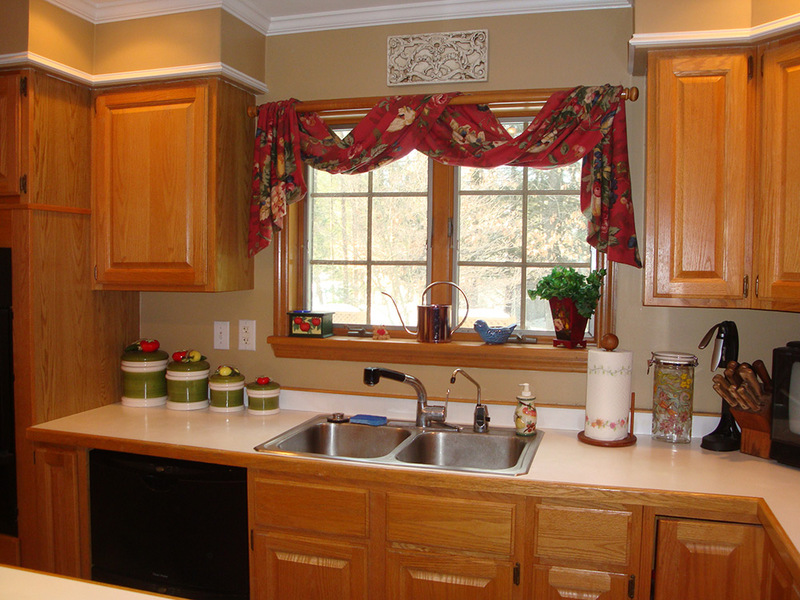 Brass Cornices can be added to the top of almost any traditional type of valance. 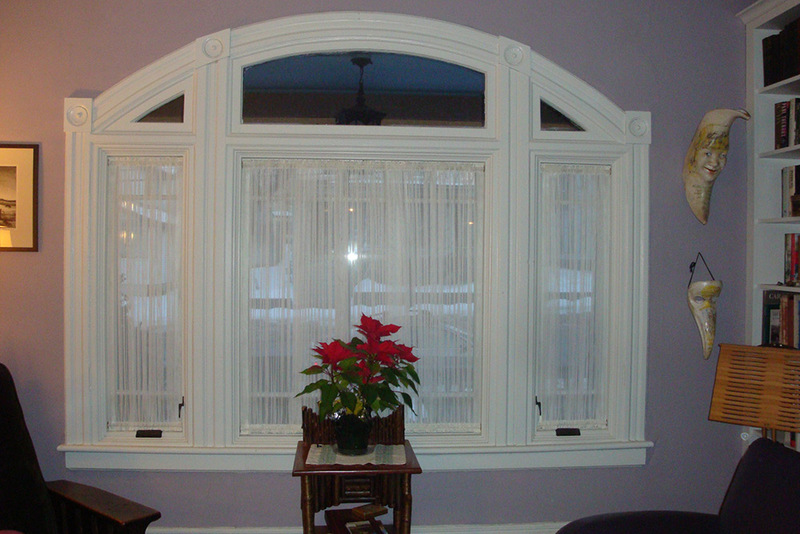 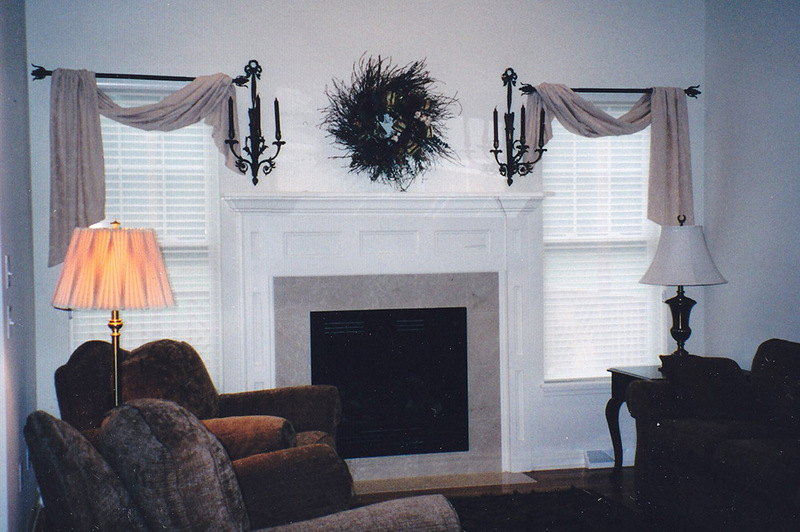 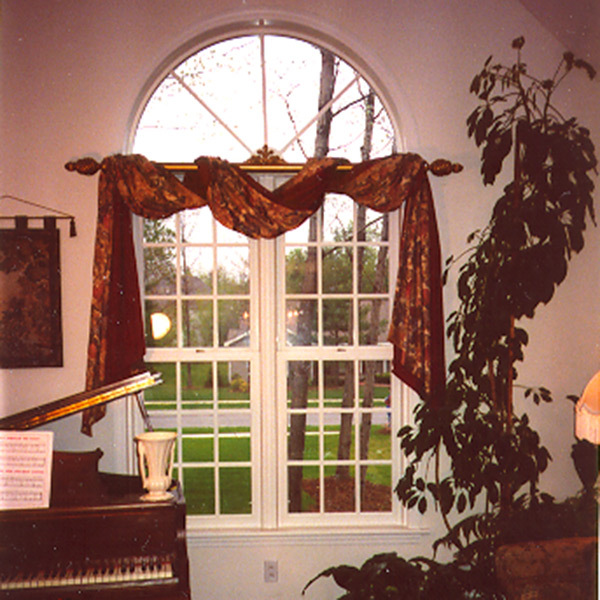 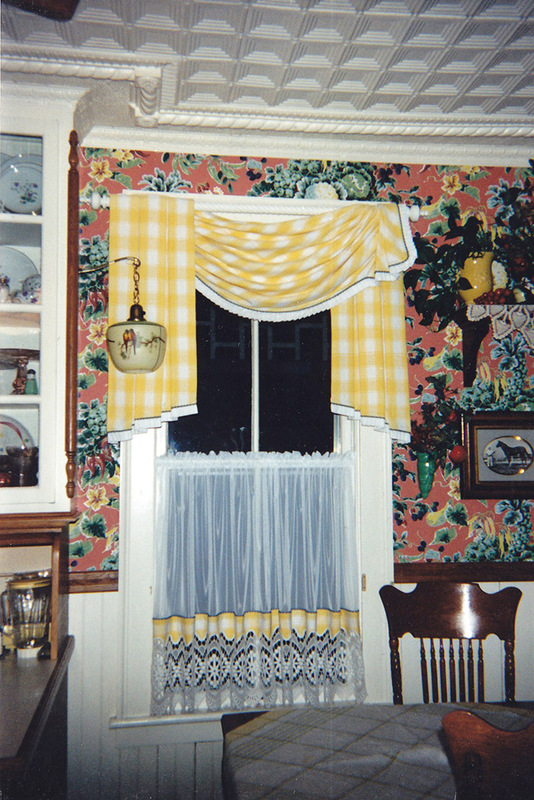 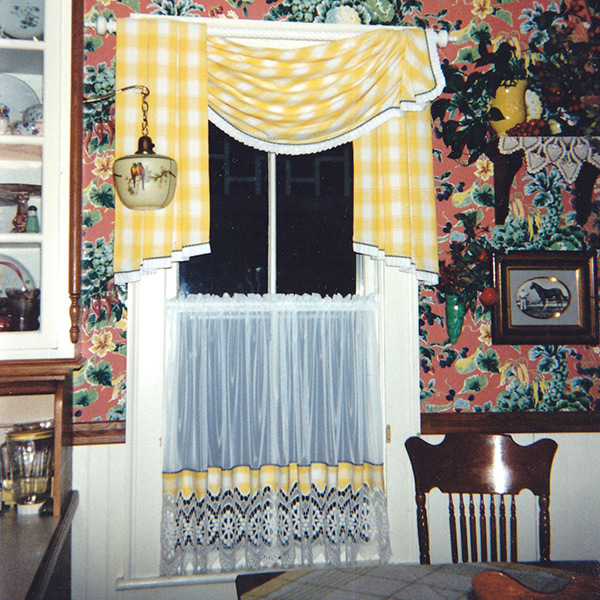 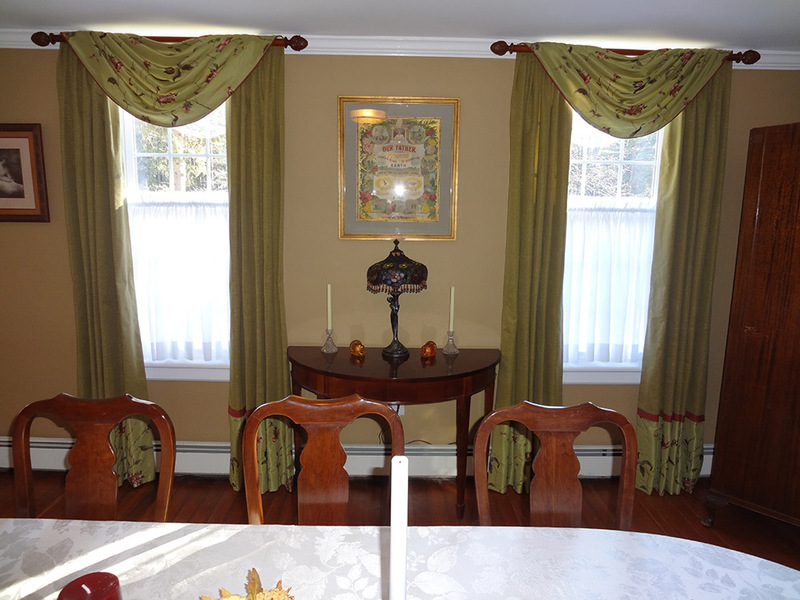 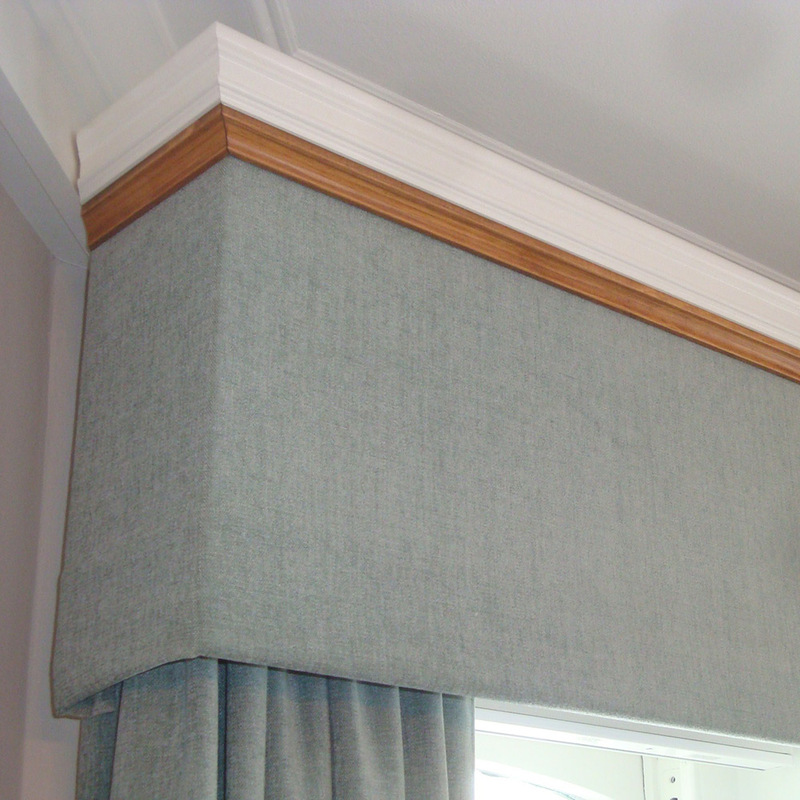 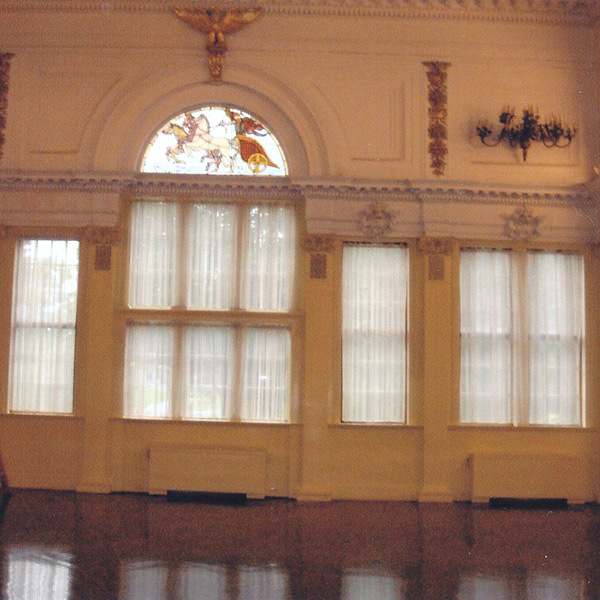 Wood Cornice Caps add small architectural design elements to fabric valances. 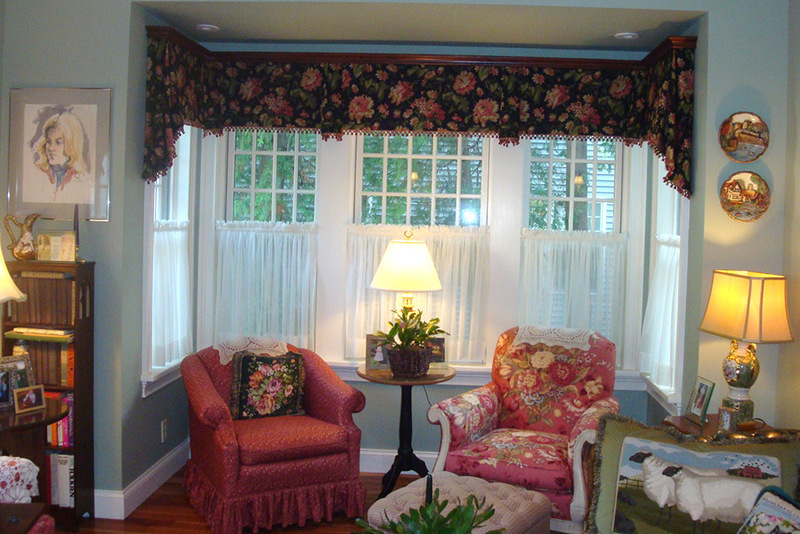 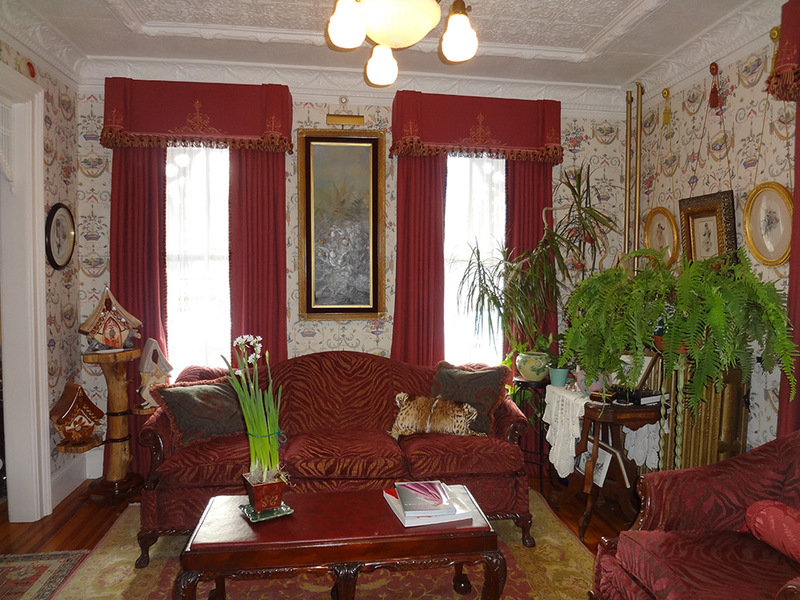 Upholstered Cornices are usually very traditional. 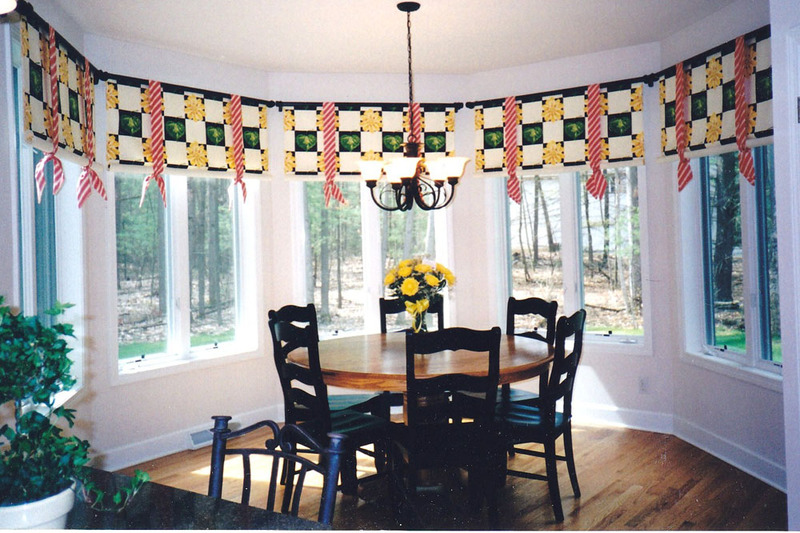 However, since they are custom-made, almost any fabric design can be used over any uniquely-designed wooden shape, to create a more modern look. 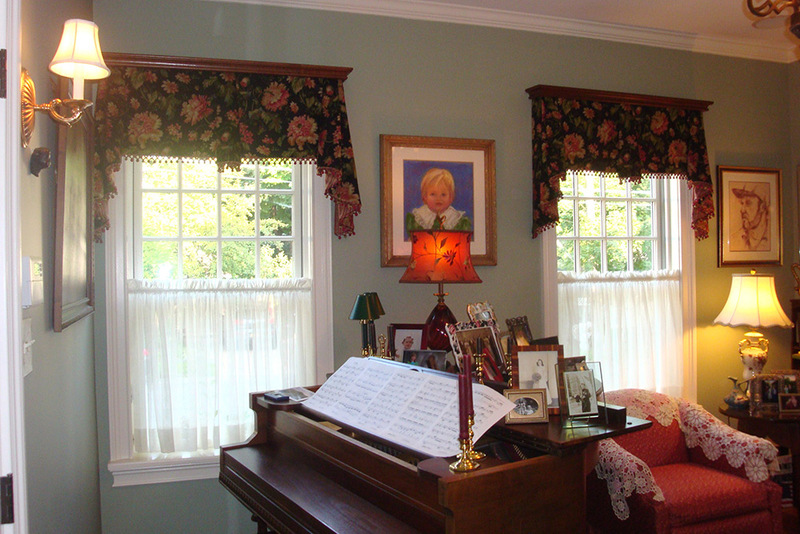 Wooden Cornices can stand alone as an architectural valance. 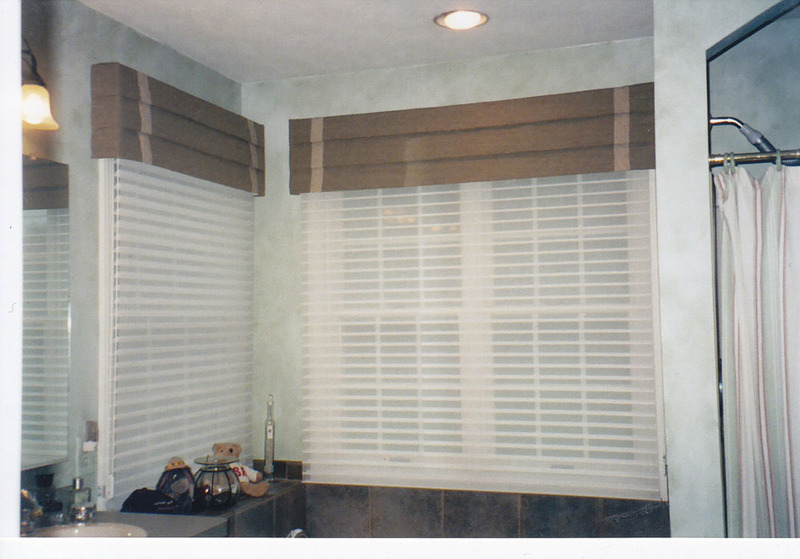 They can also be added to blinds and shades as well as drapery panels. 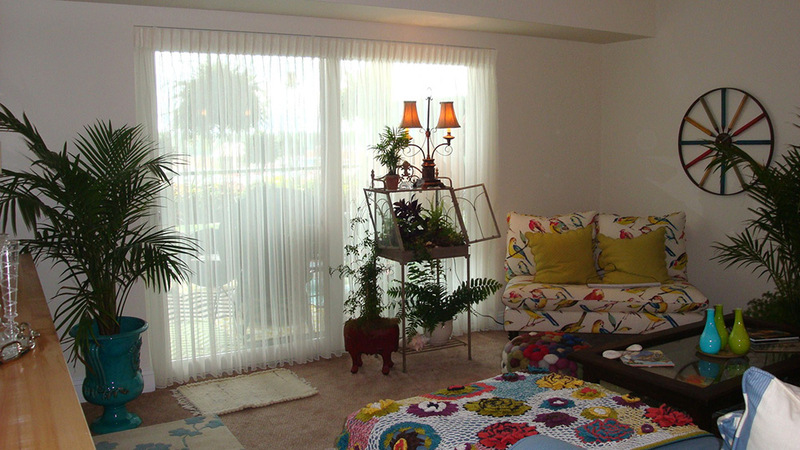 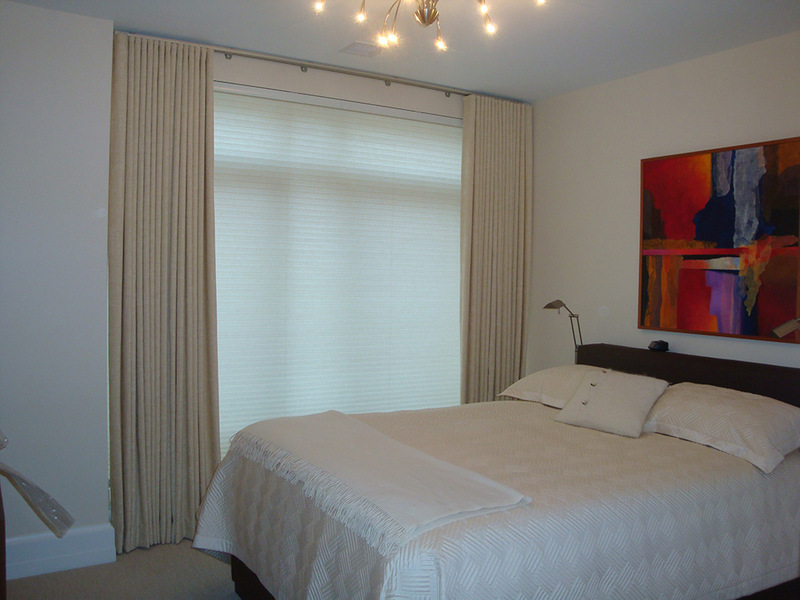 Sheers give you modest privacy without blocking all the light and visibility. 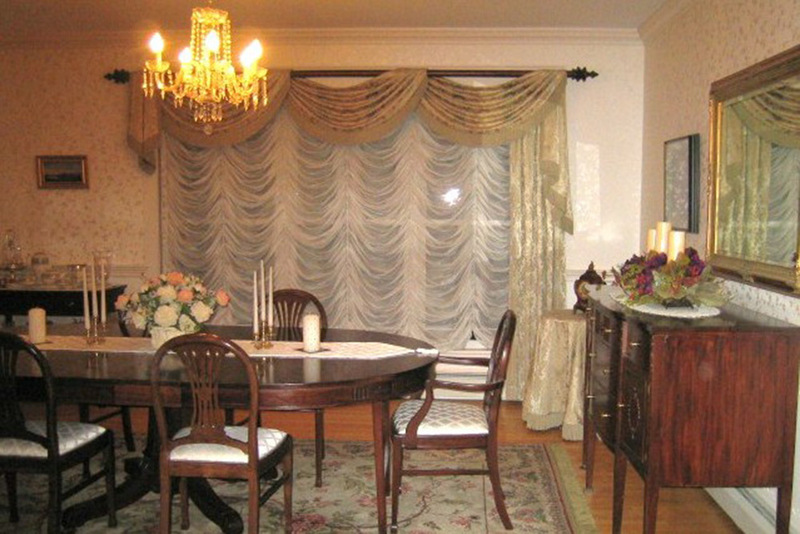 Do you recognize the location where these sheer curtains are hung? 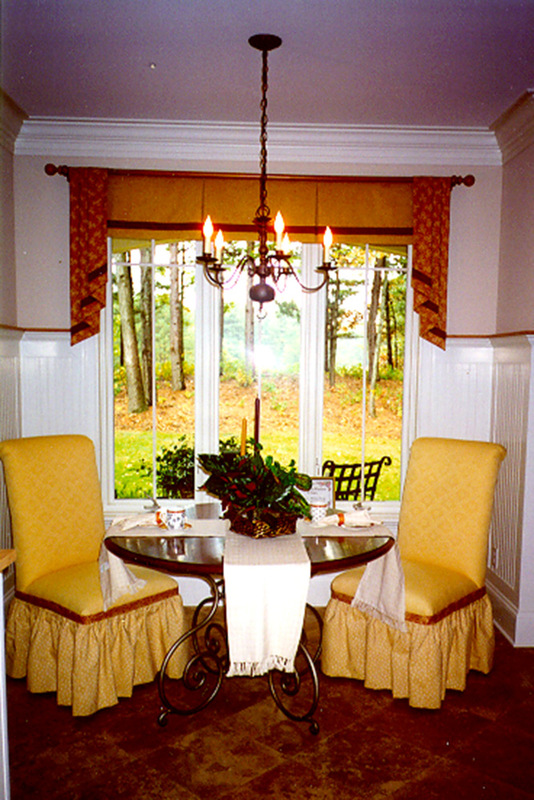 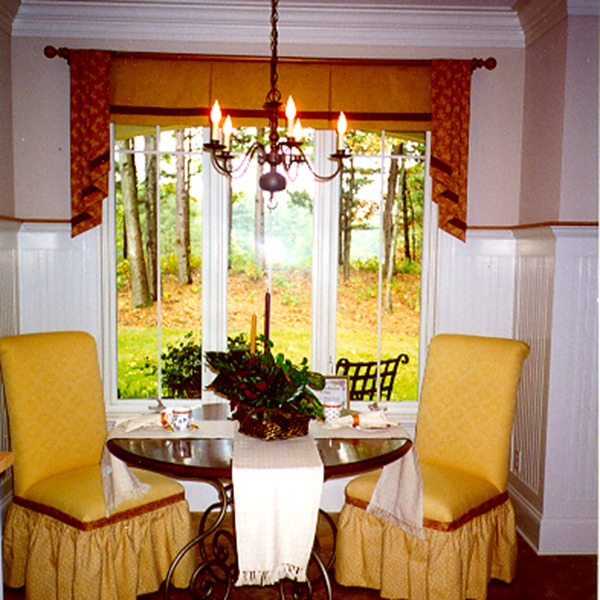 Café Sheers are used when only modest privacy is needed in the lower half of the window. 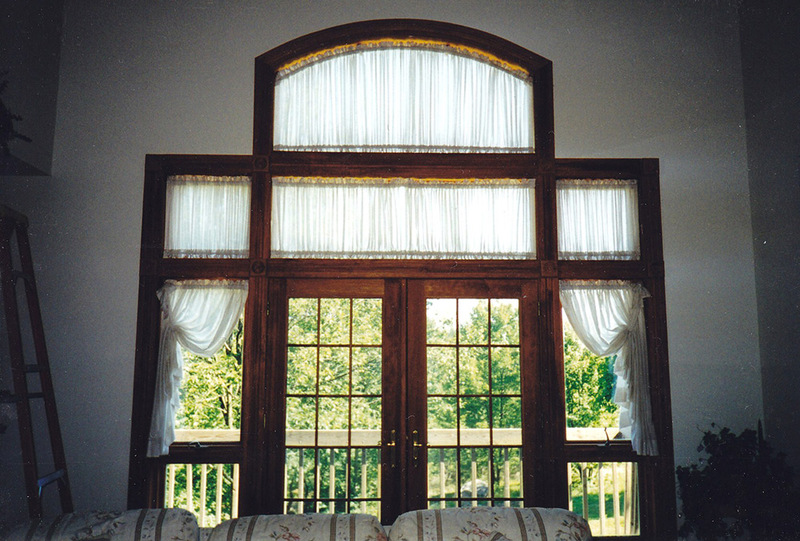 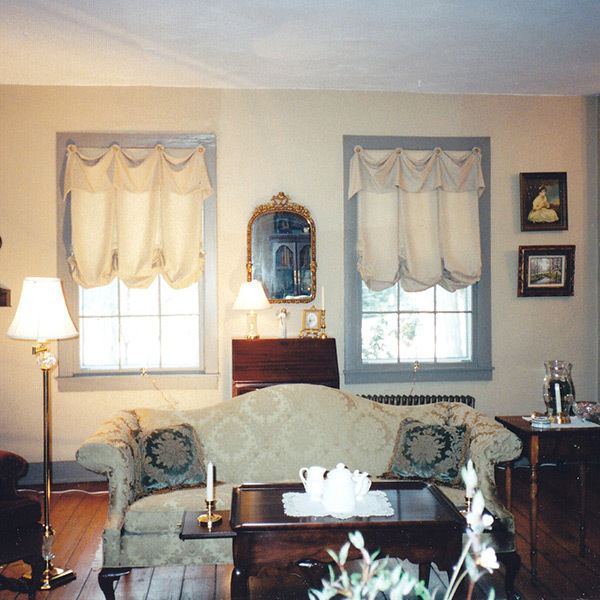 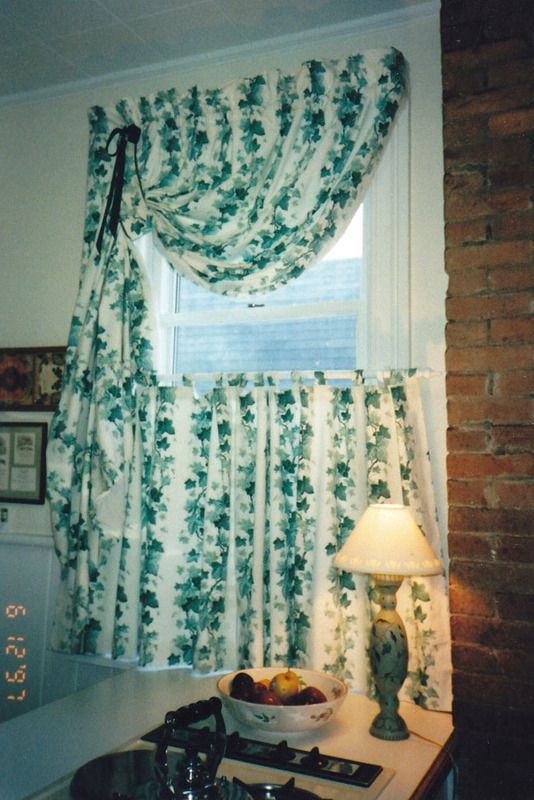 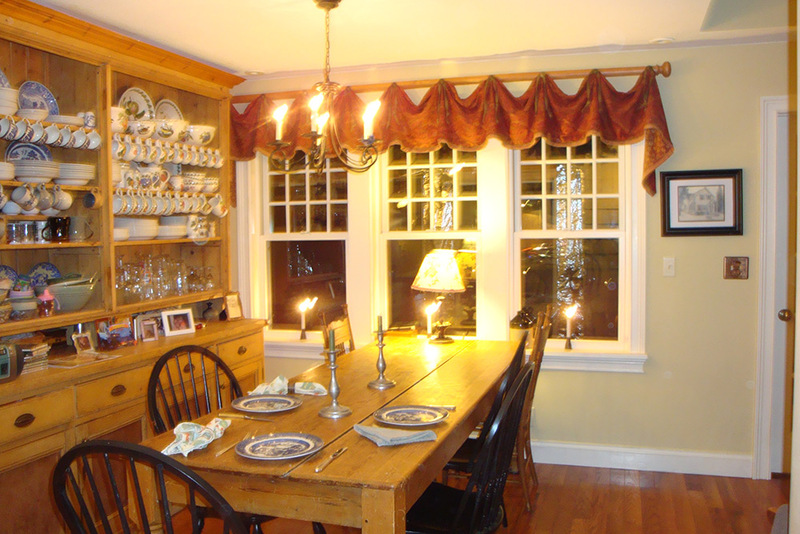 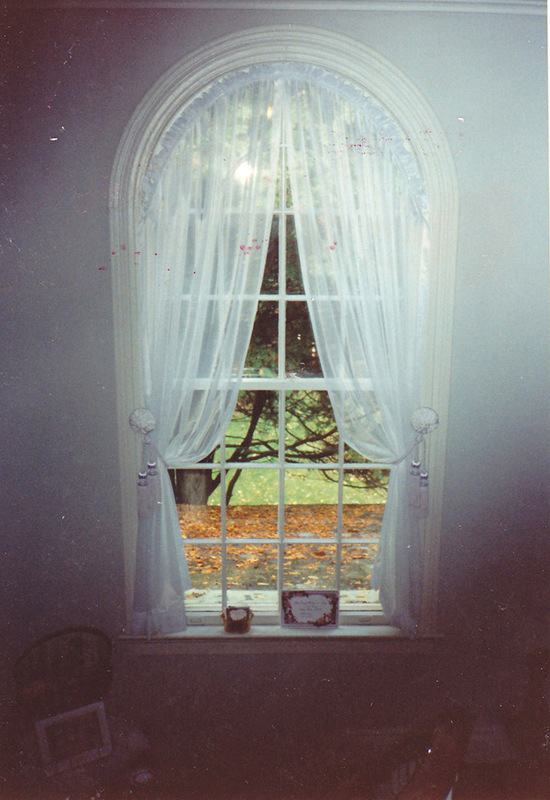 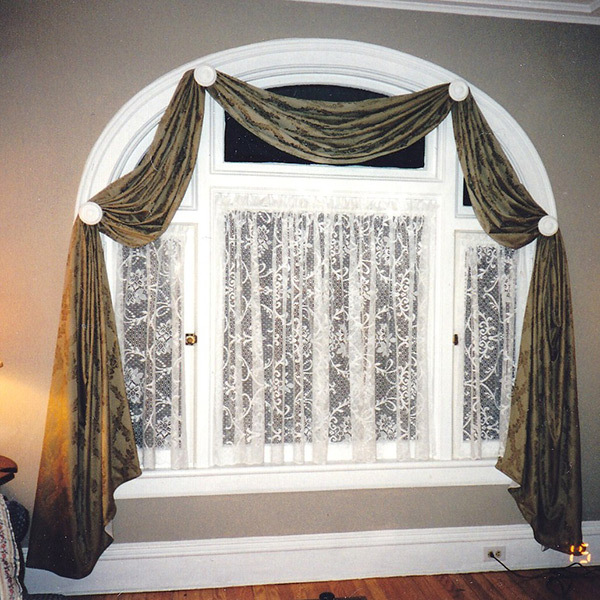 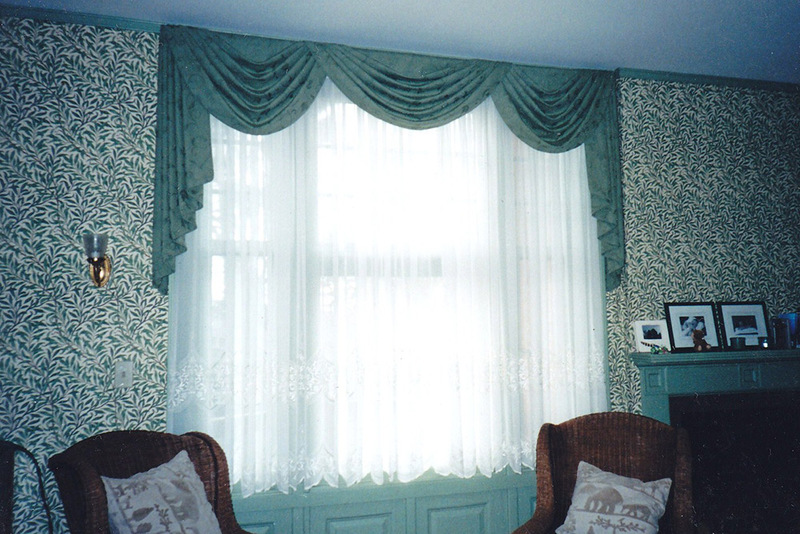 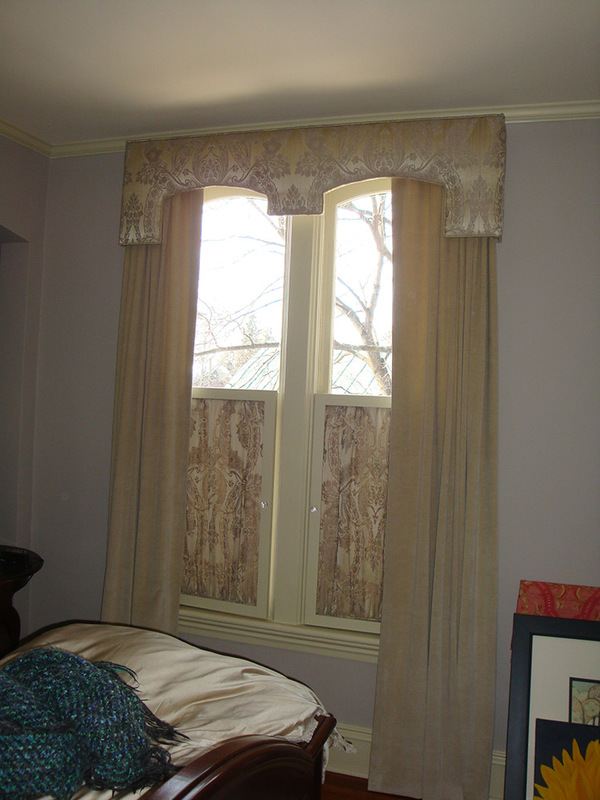 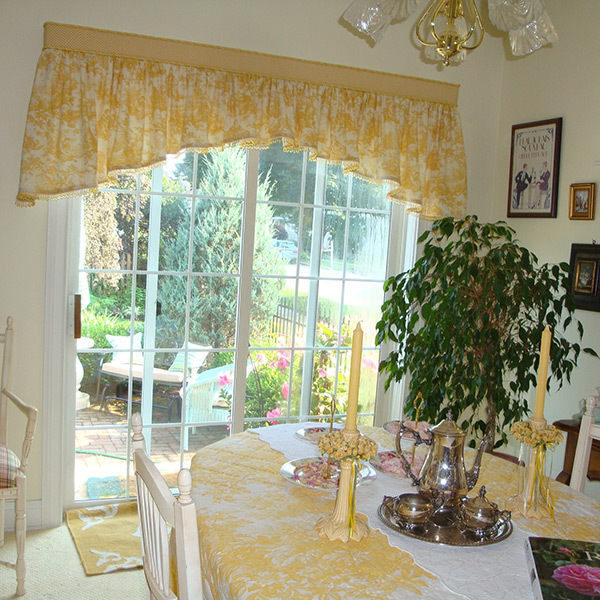 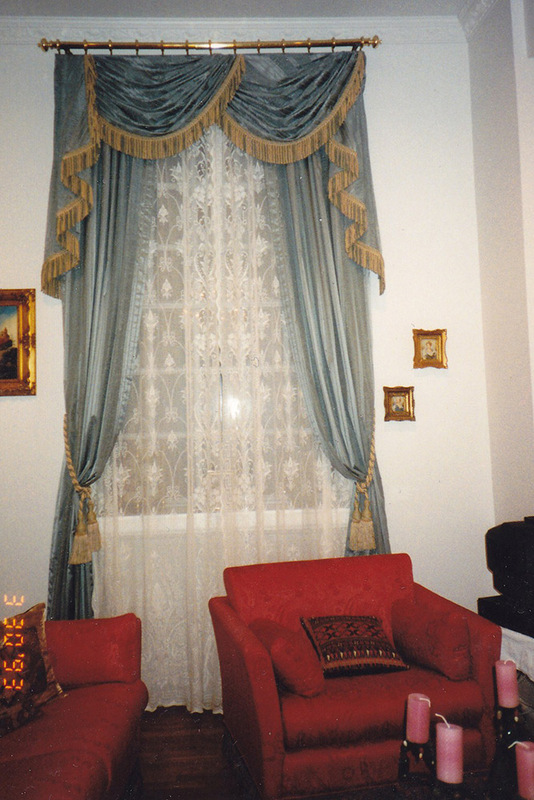 Sheers with 8″ Lace are a traditional European type of window treatment. 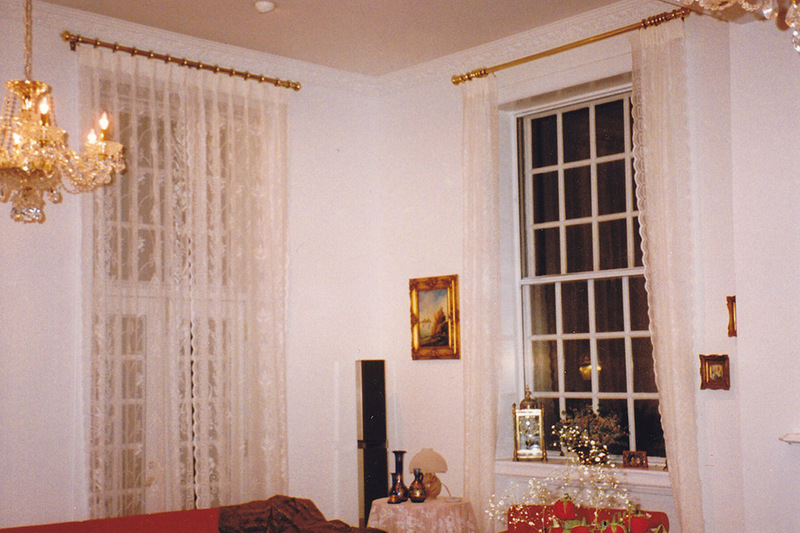 This combination of sheer and lace is widely used in Denmark, Holland, and Germany. 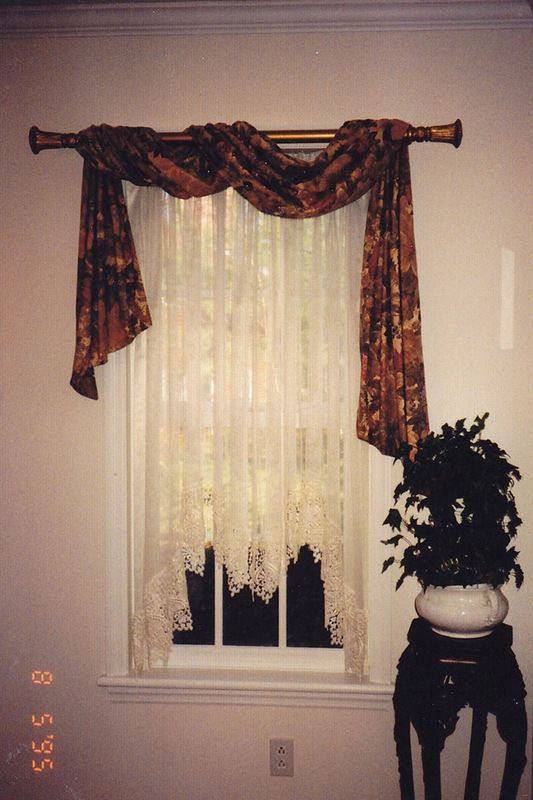 Lace Sheers have an interesting pattern woven into the fabric, which provides more privacy. 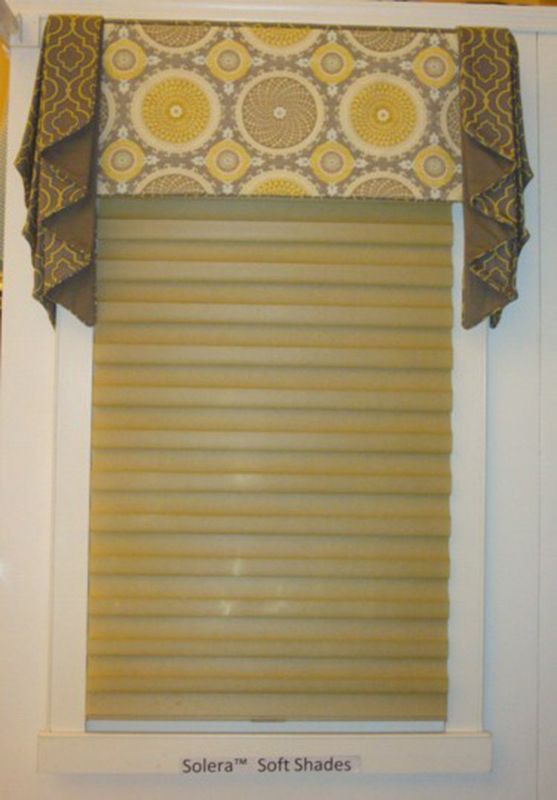 Sometimes a window treatment just cannot fit into one category!